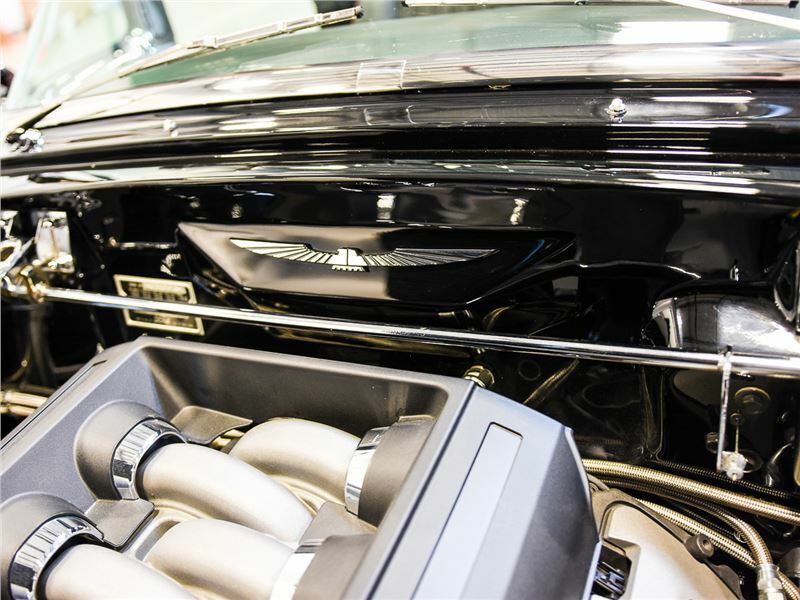 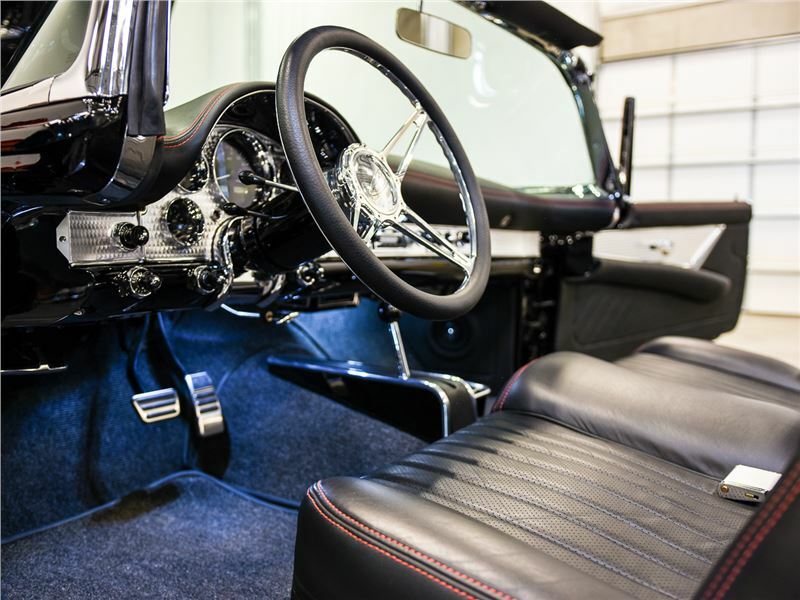 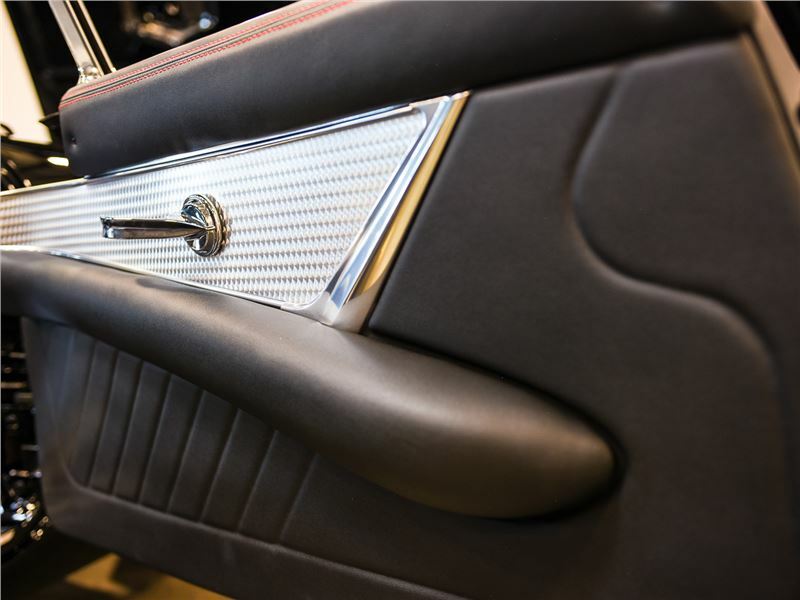 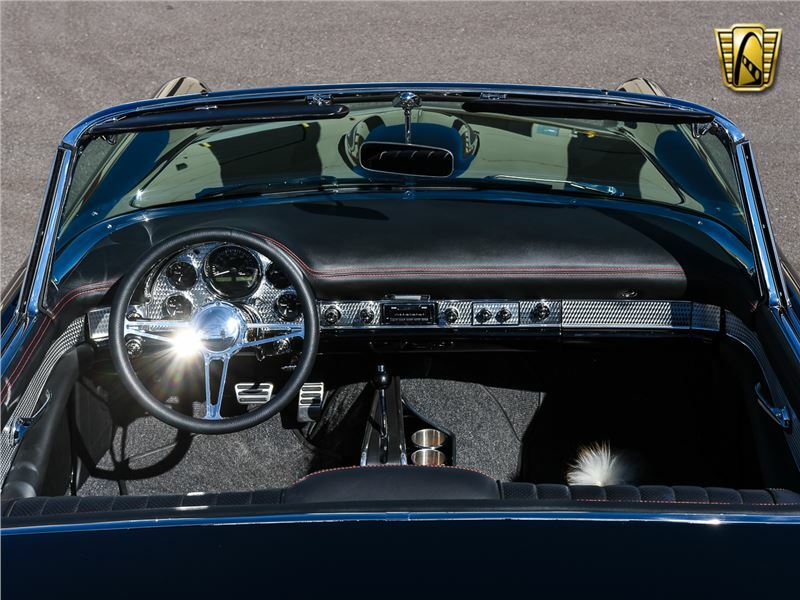 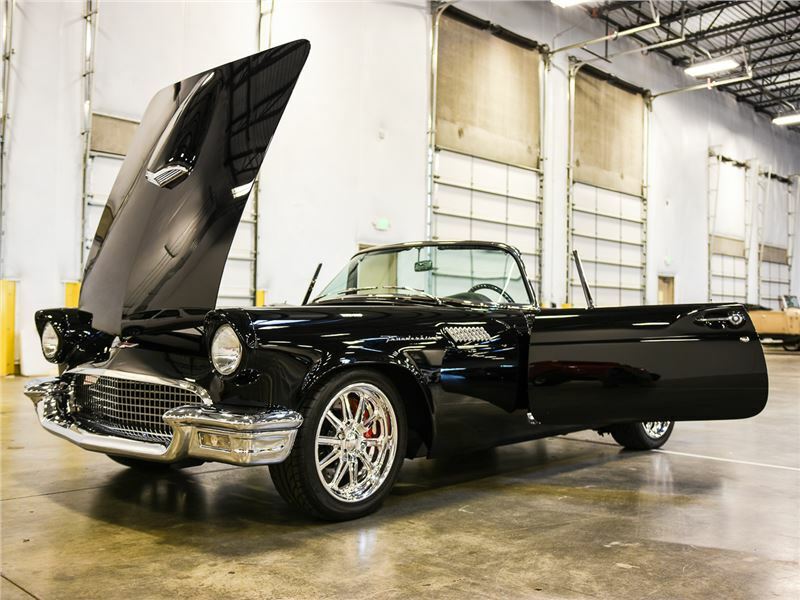 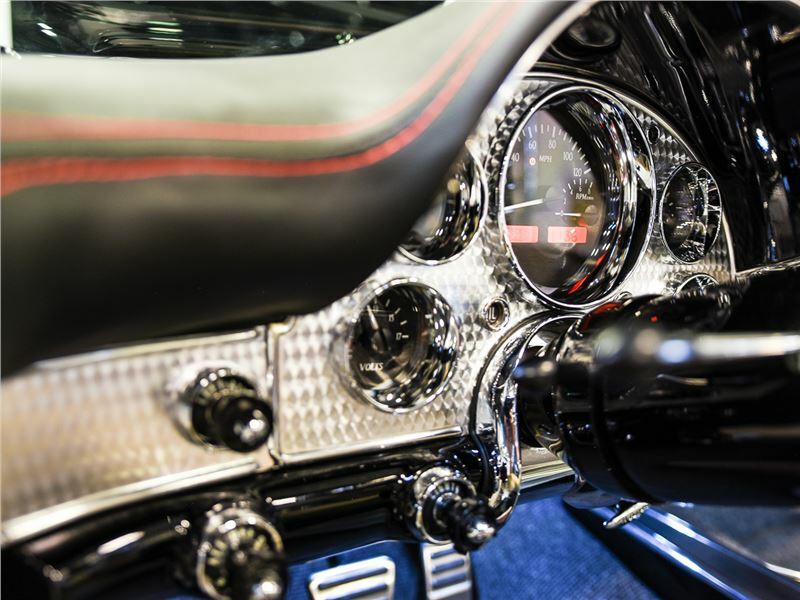 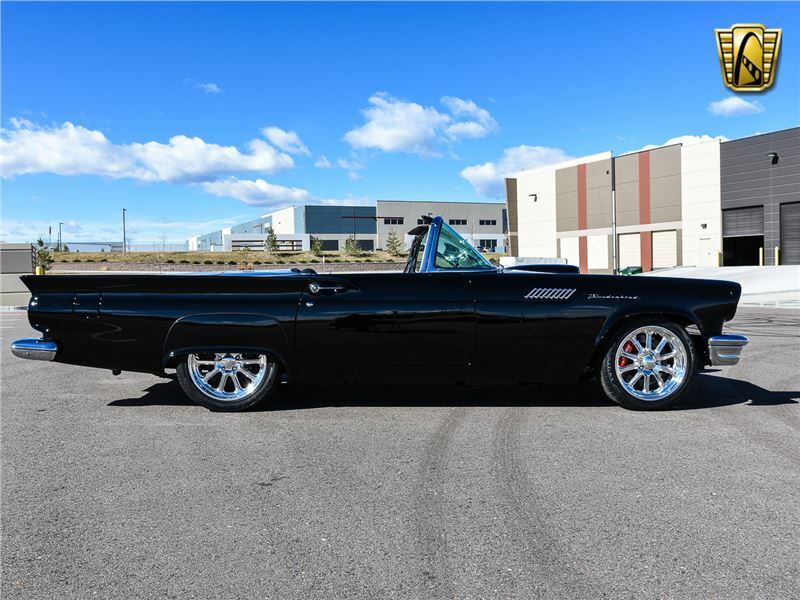 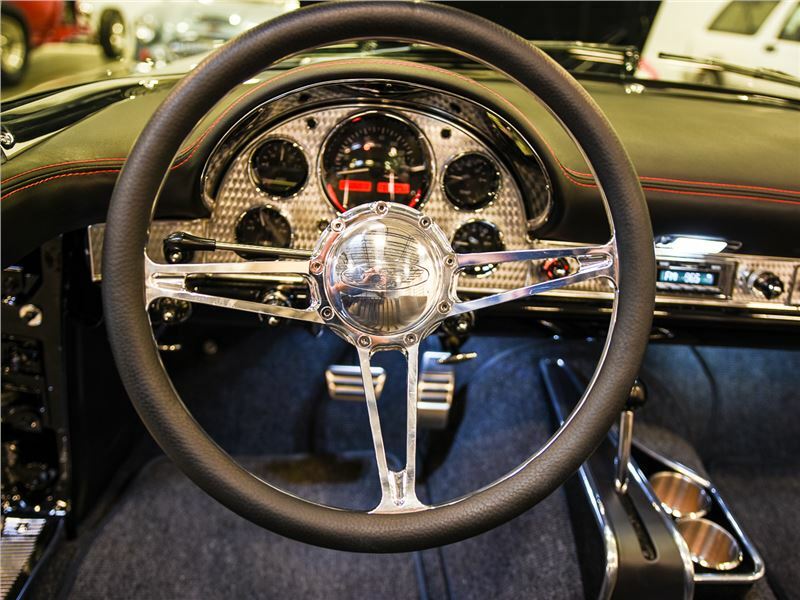 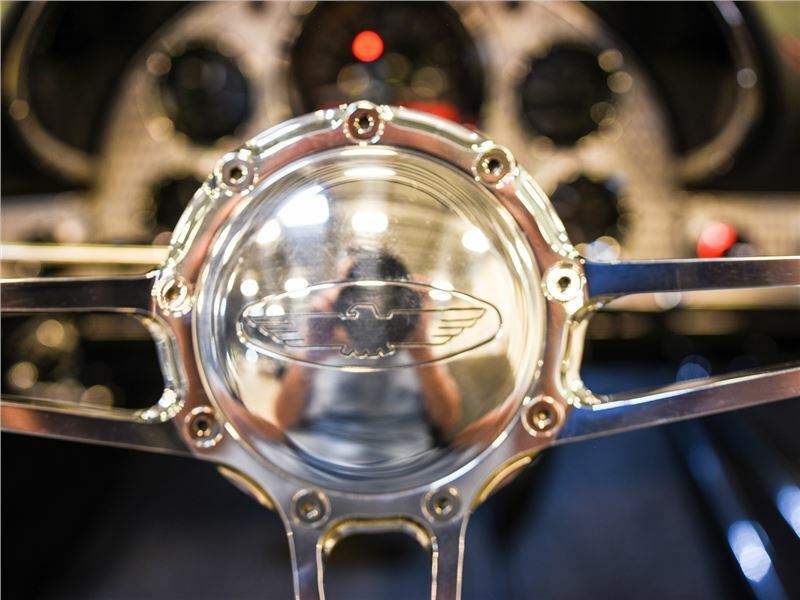 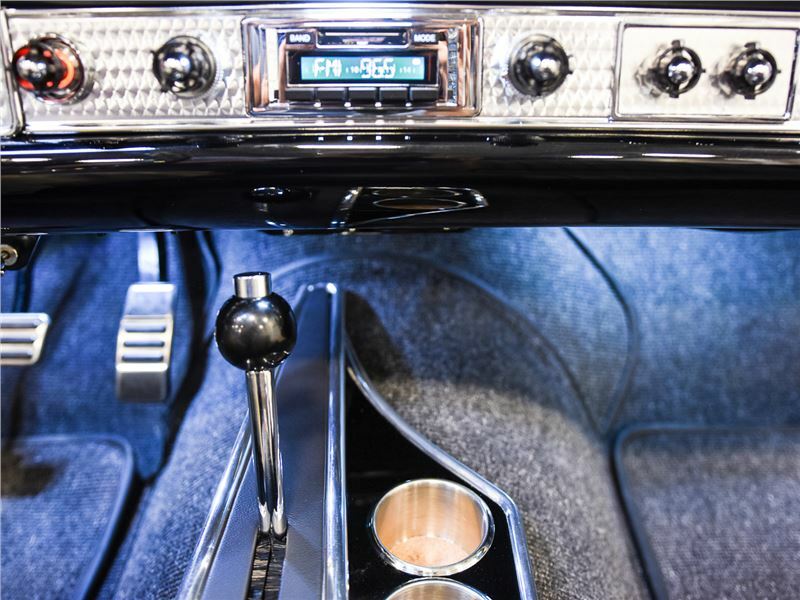 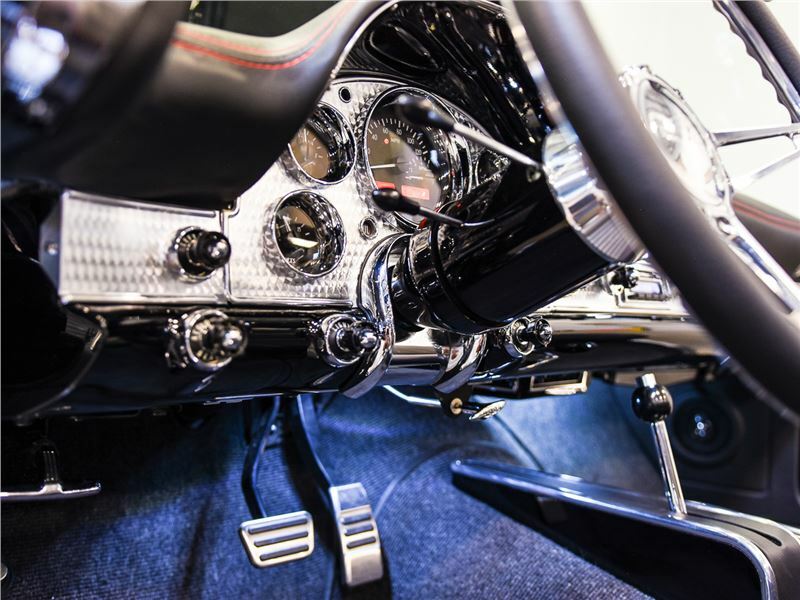 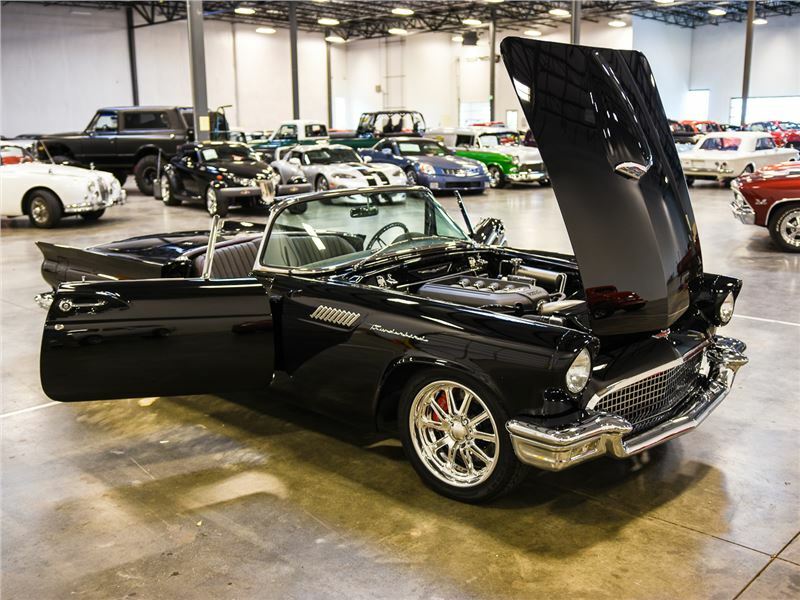 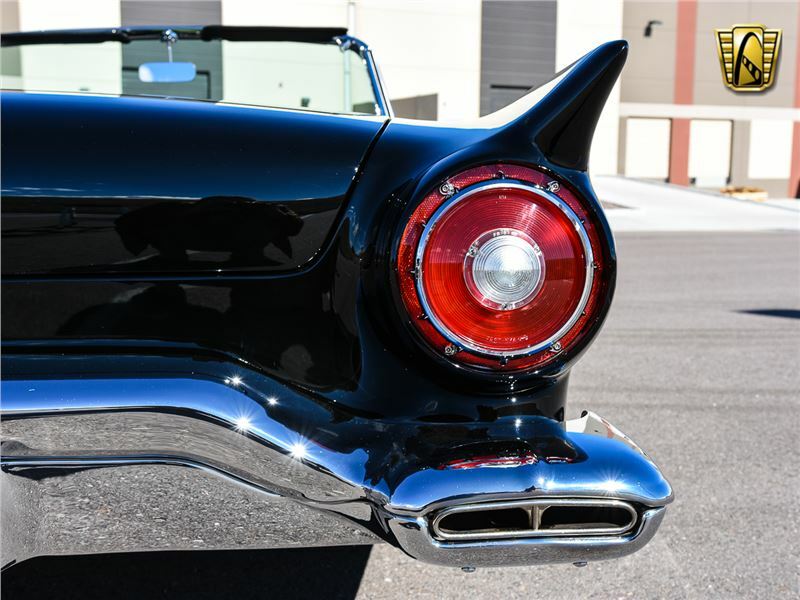 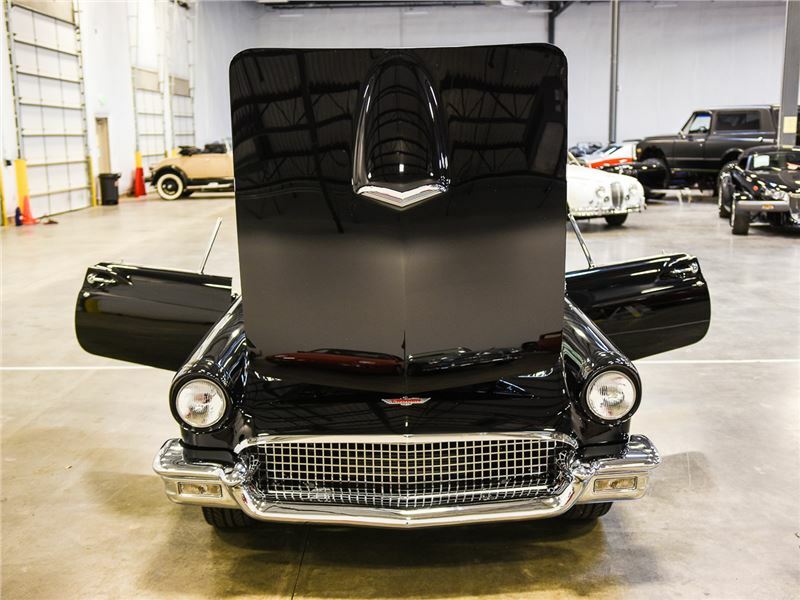 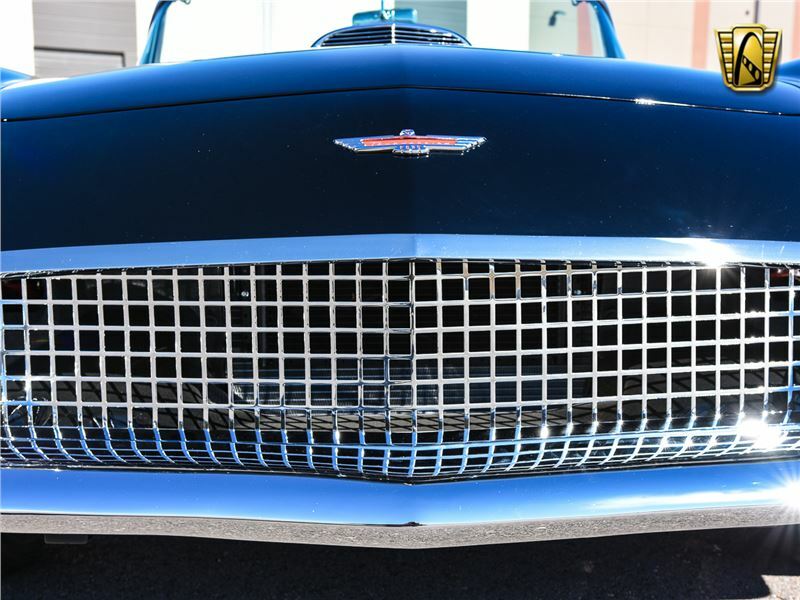 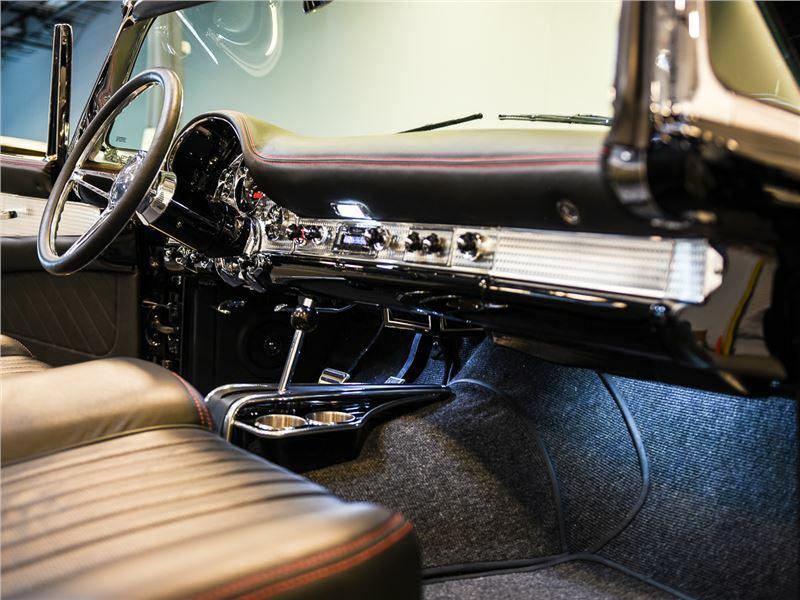 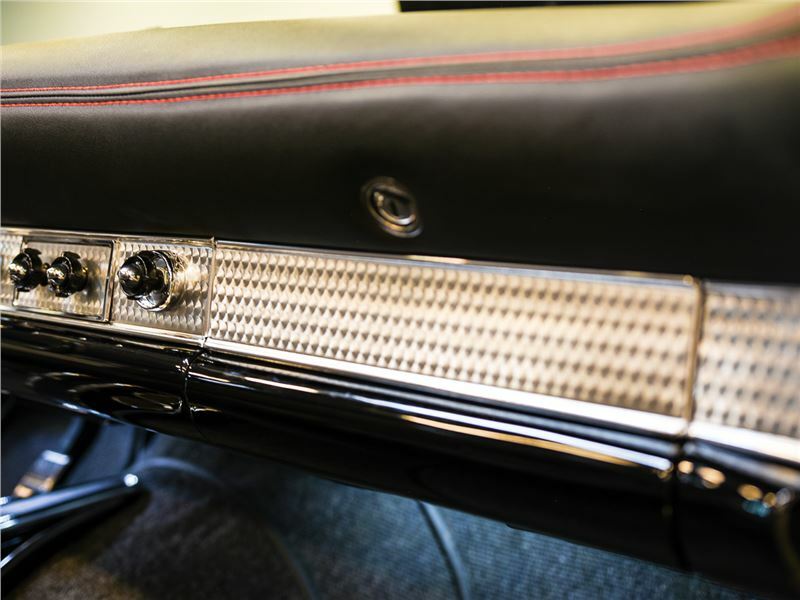 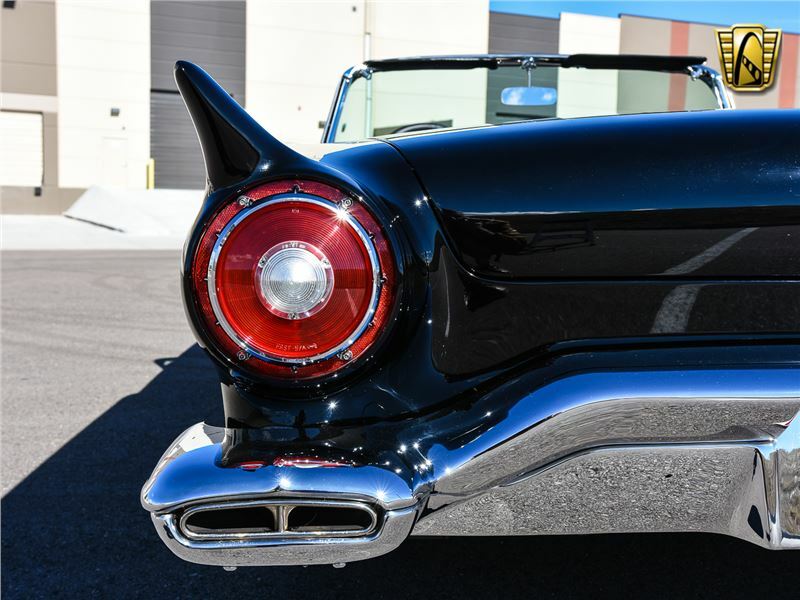 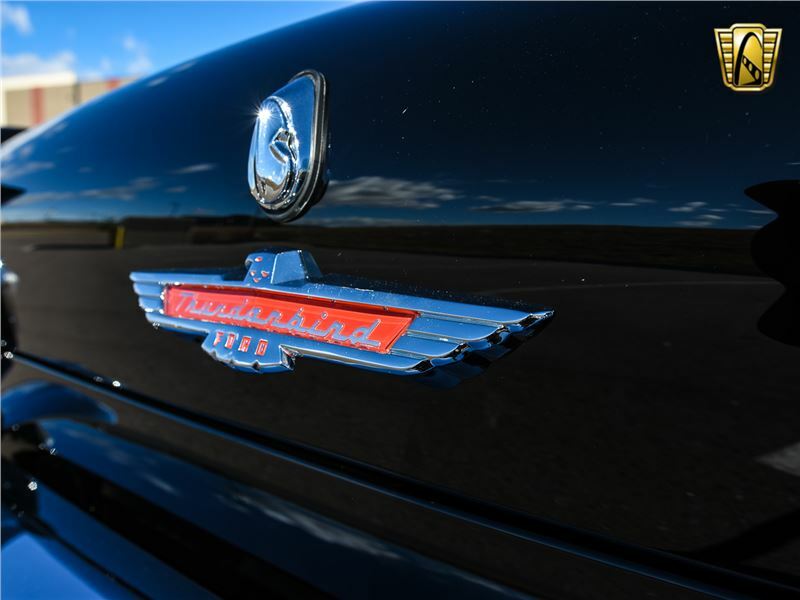 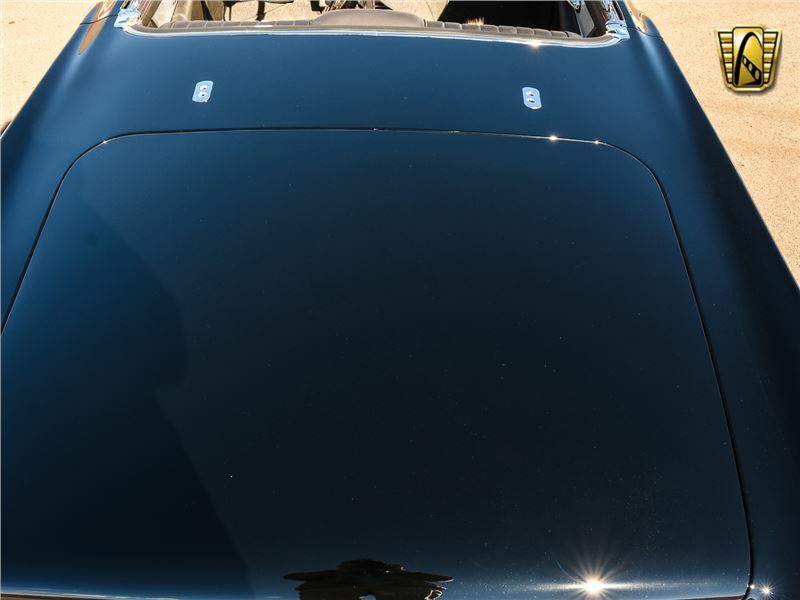 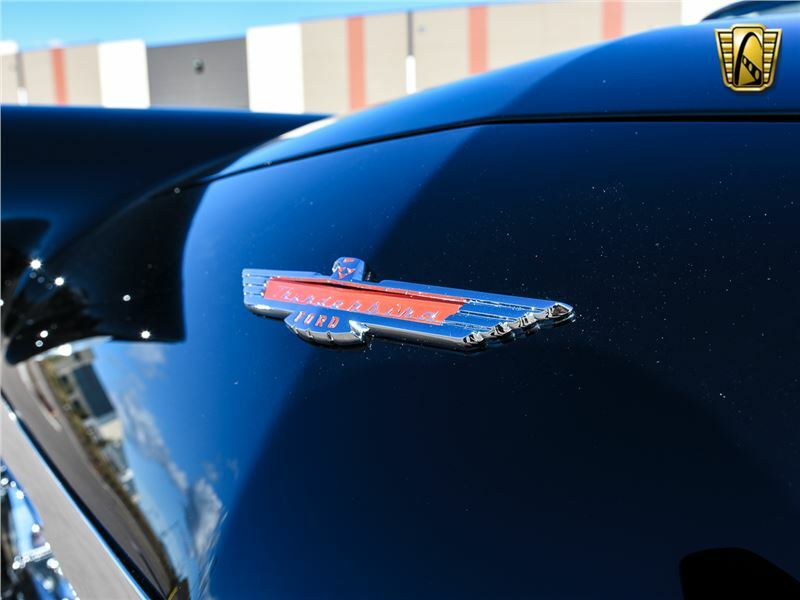 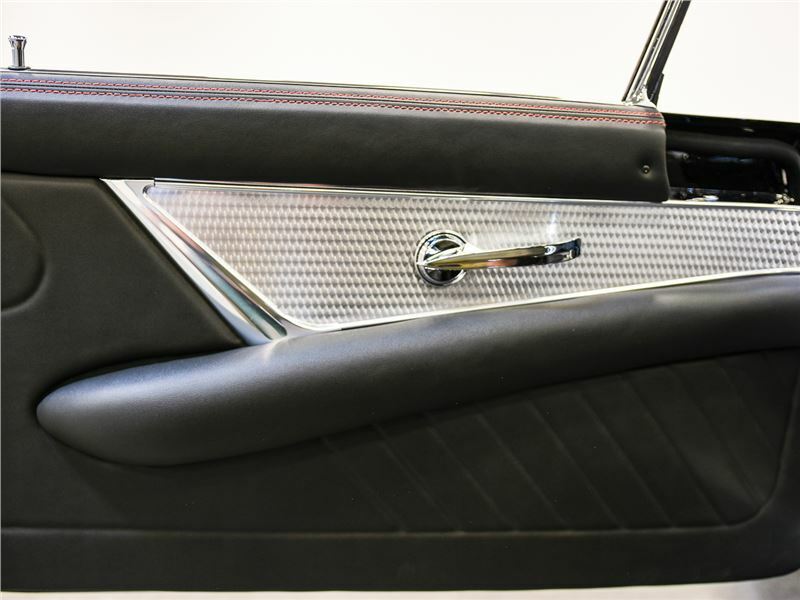 Now featured in our Denver showroom is a one of a kind show-stopping 1957 Ford Thunderbird that had no expense sparred in the meticulous build that it underwent. 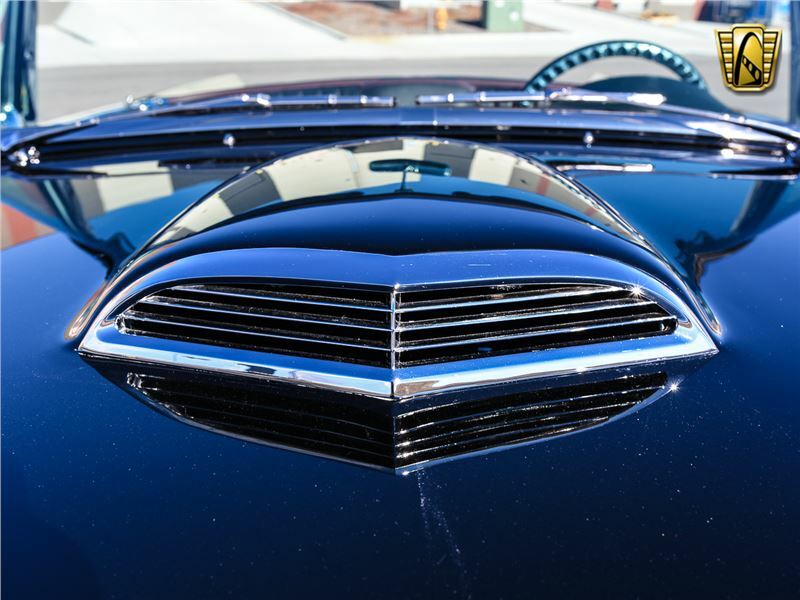 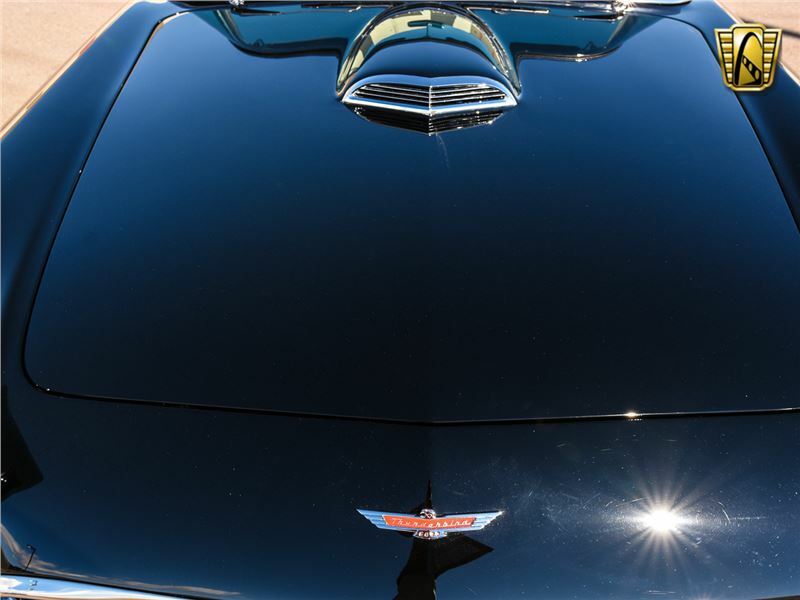 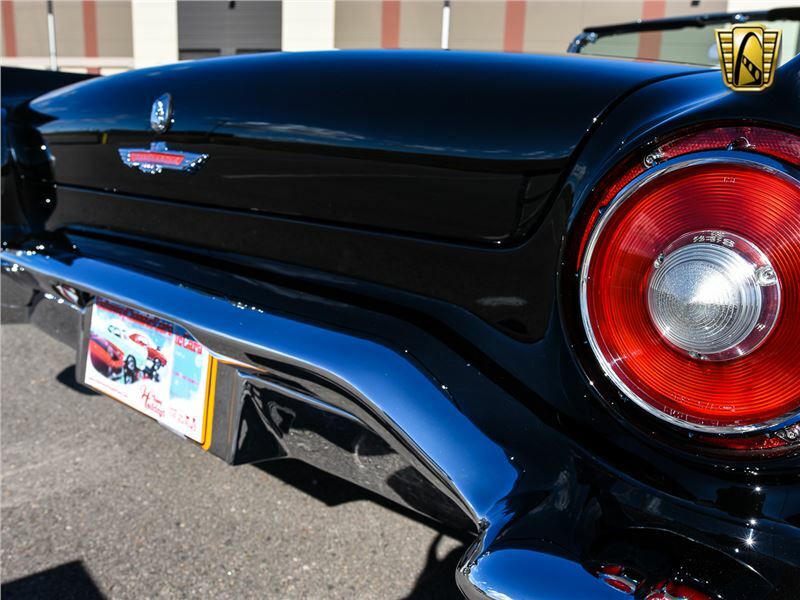 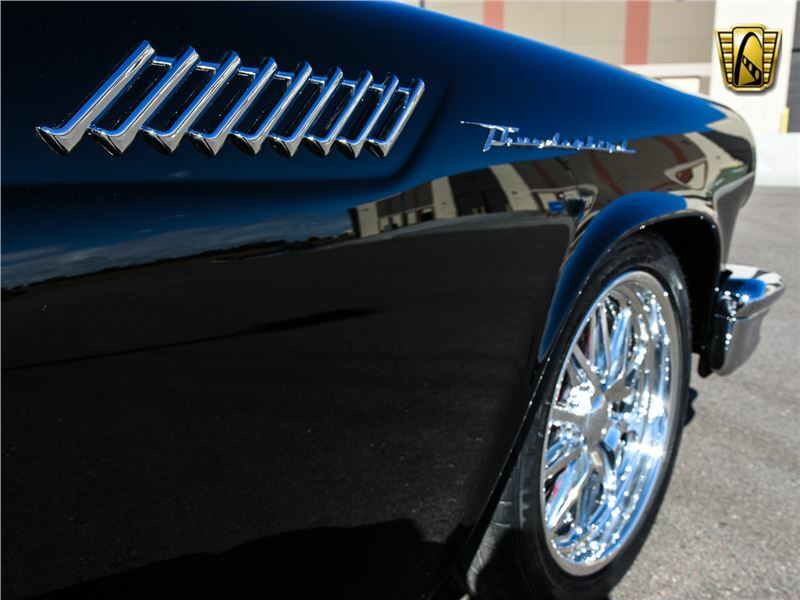 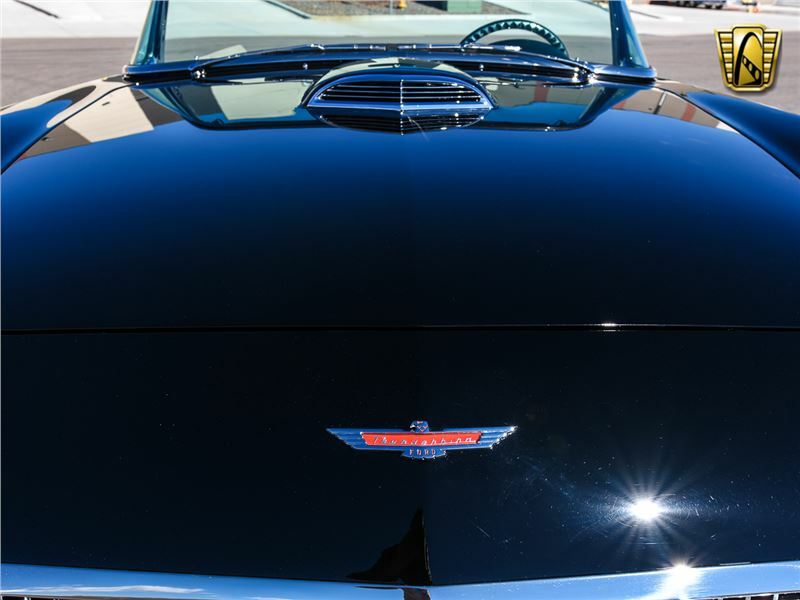 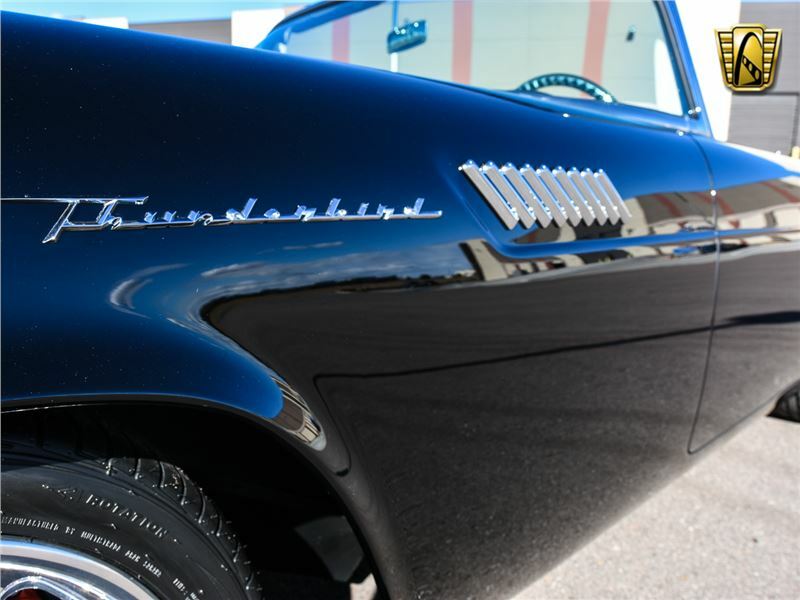 Everywhere you look on this classic T-bird the quality of work will leave you speechless! 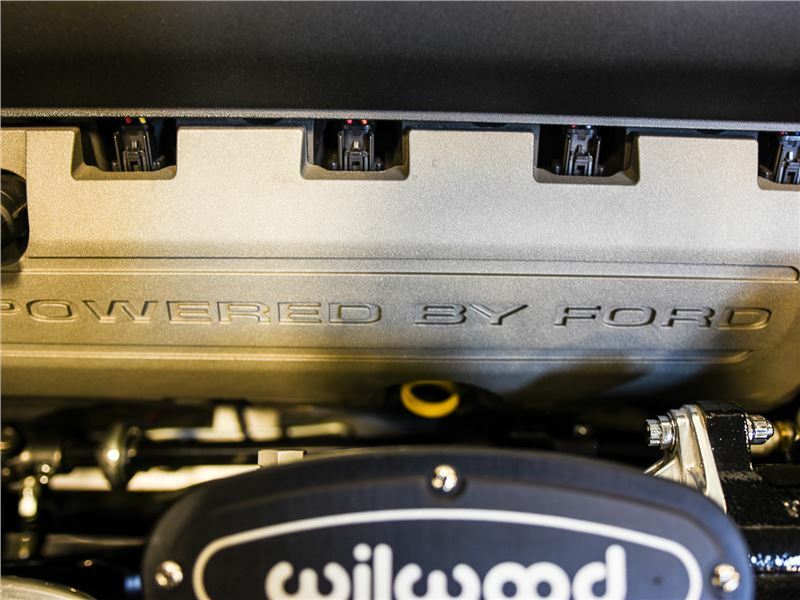 The heart and soul of this car is a Coyote 5.0L V8 that, when you open up the hood, was clearly the centerpiece around the build. 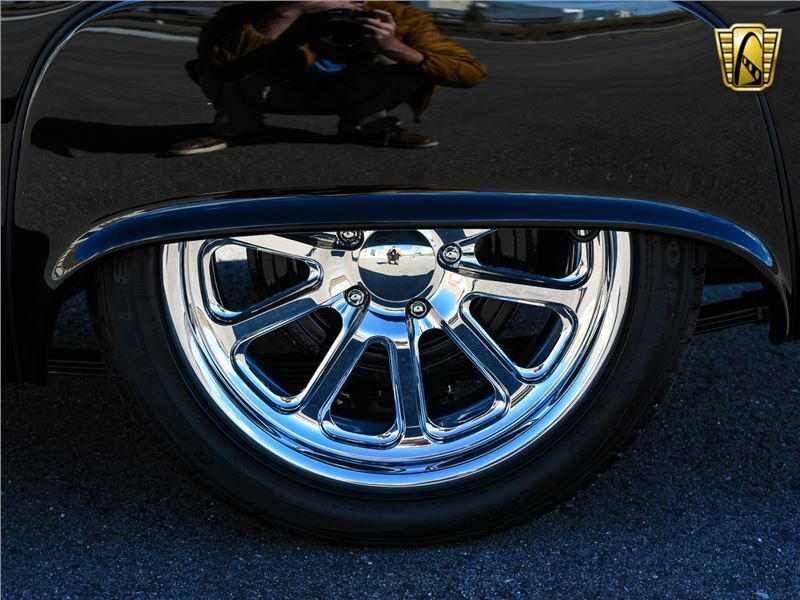 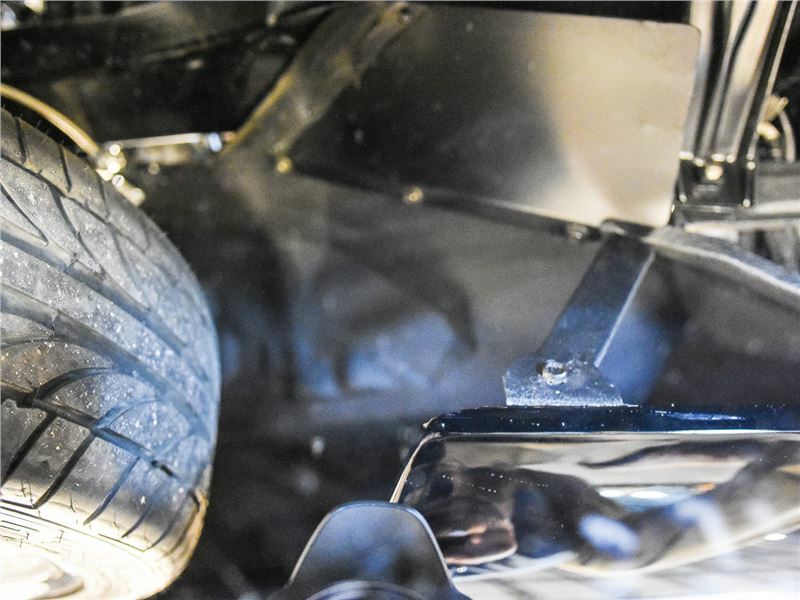 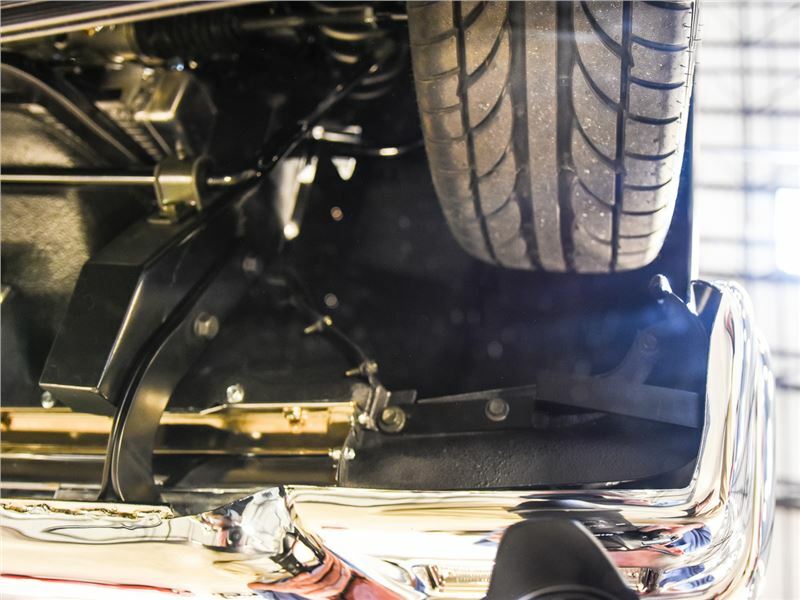 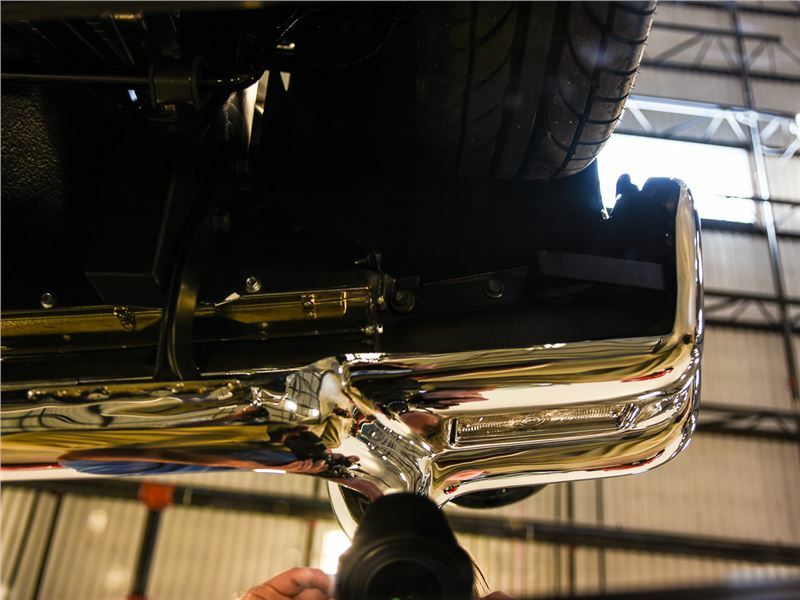 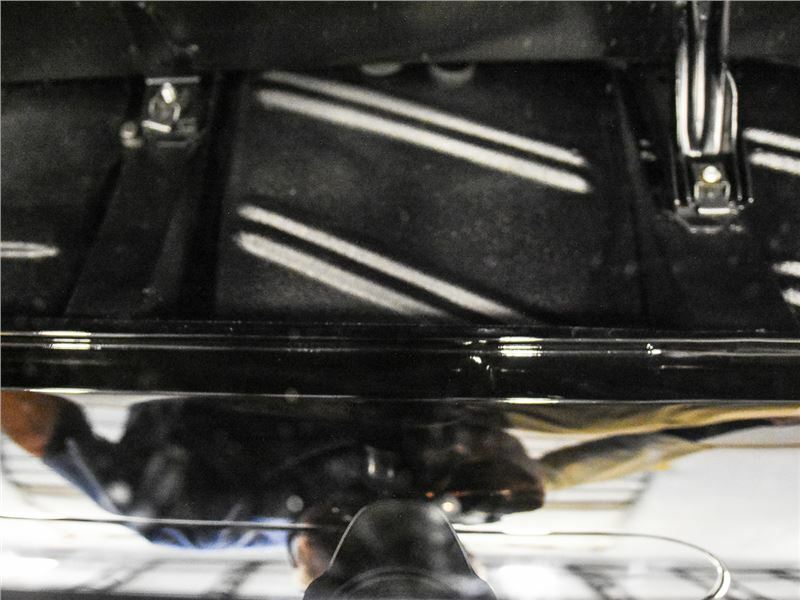 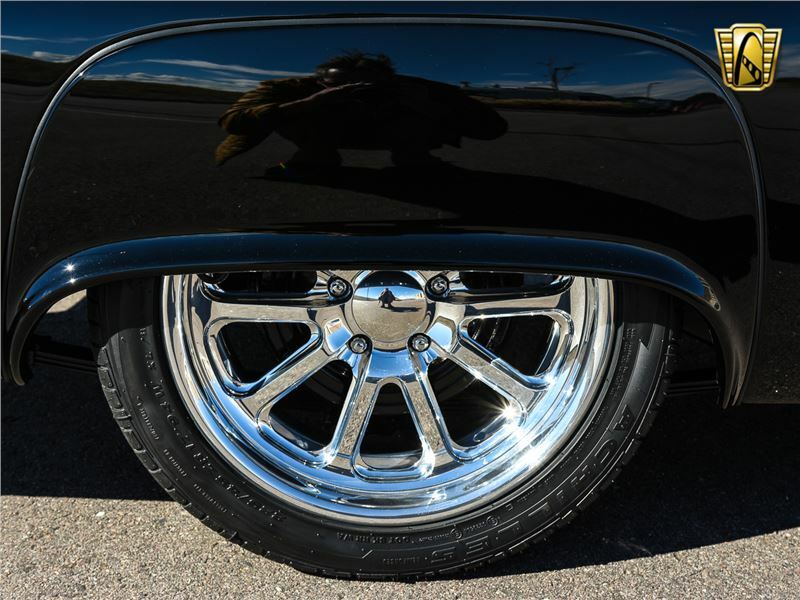 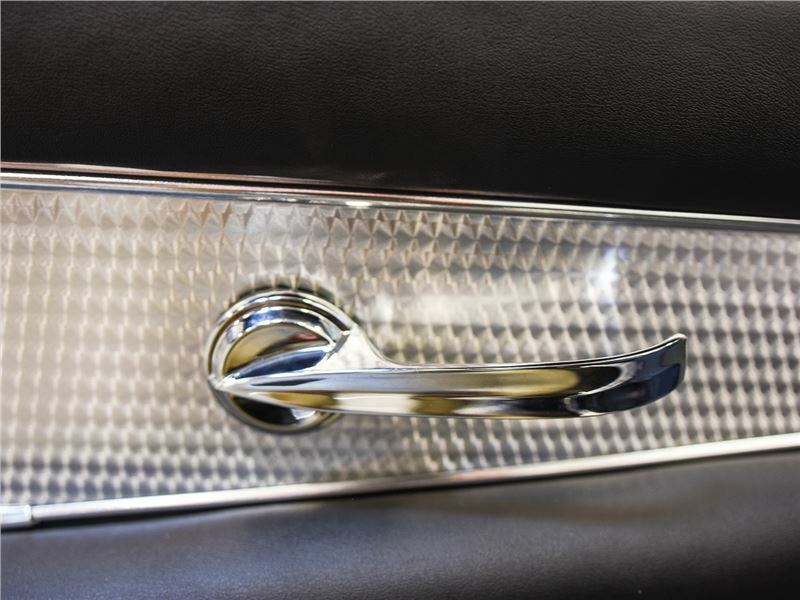 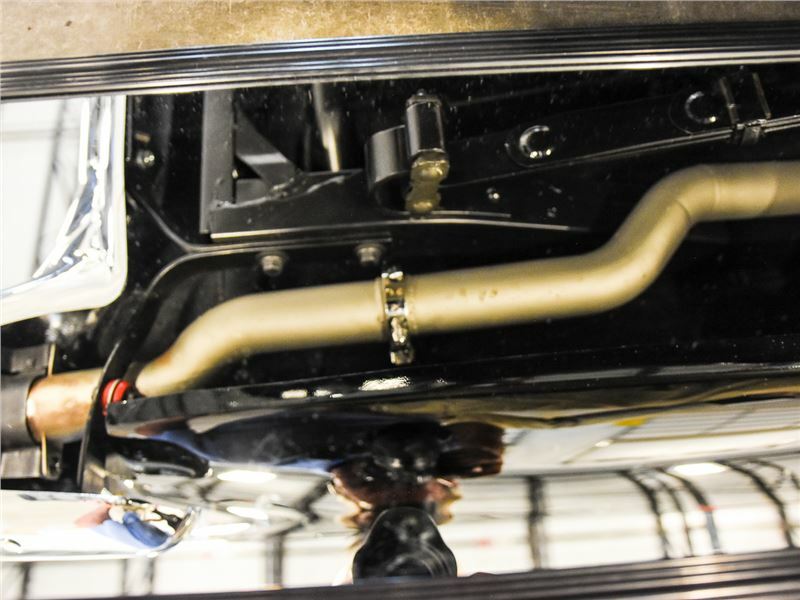 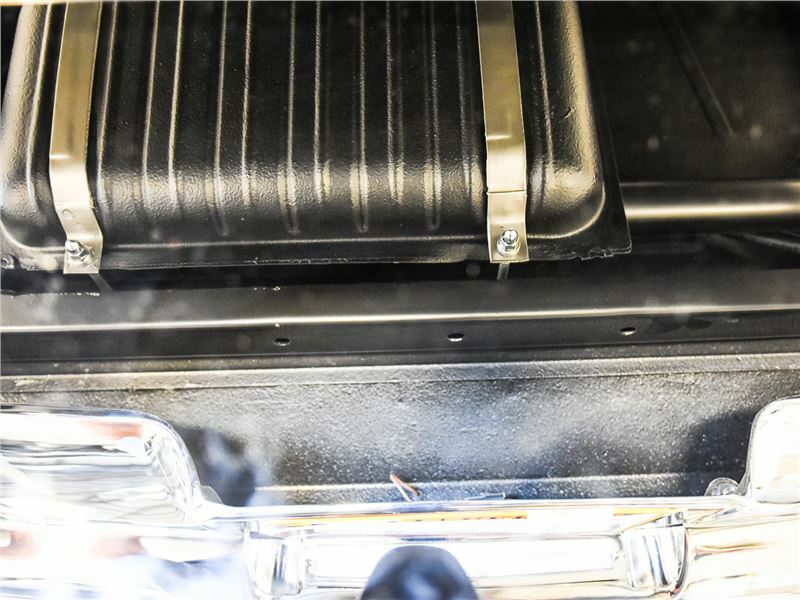 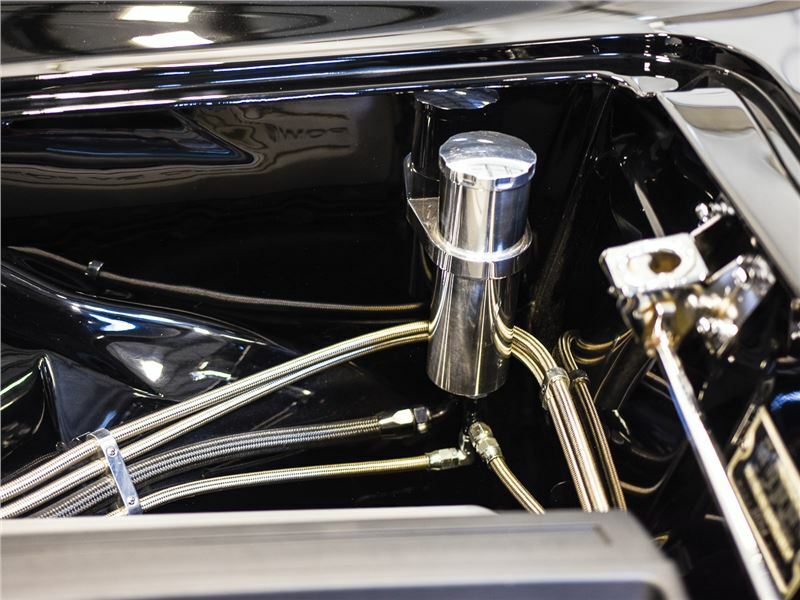 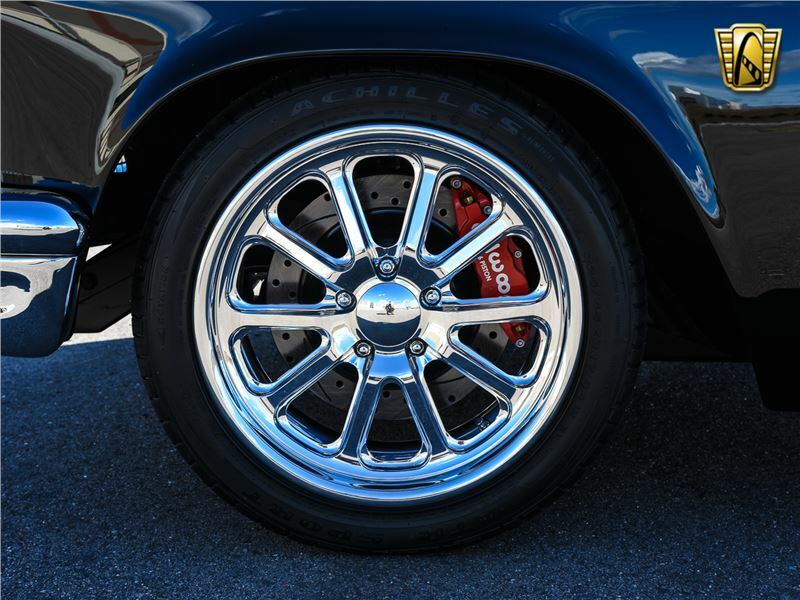 The firewall and inner fender wells have just as deep of a black glossy finish as the rest of the car, and with the chrome and polished accents, is a piece of art by itself. 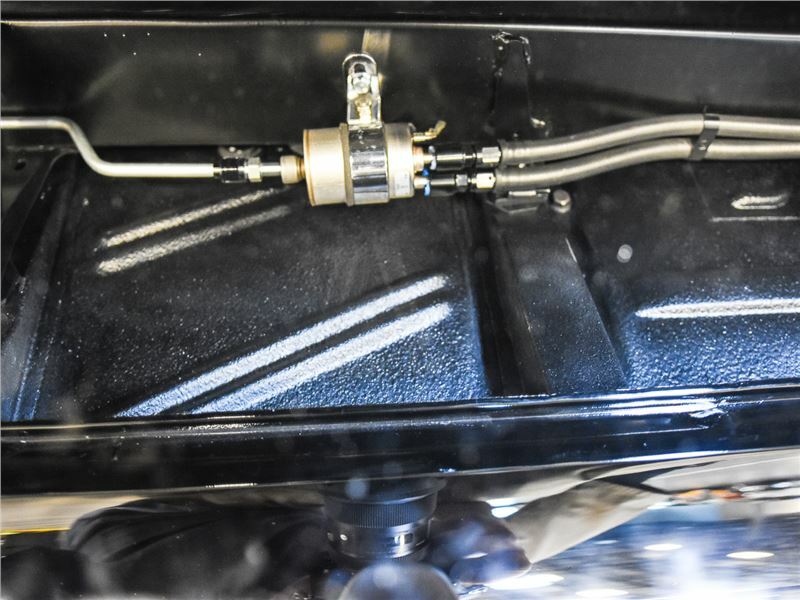 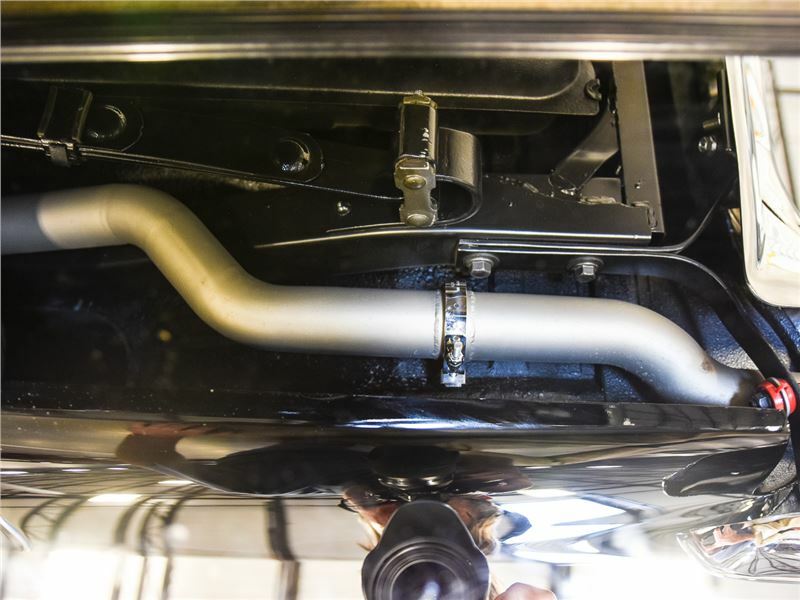 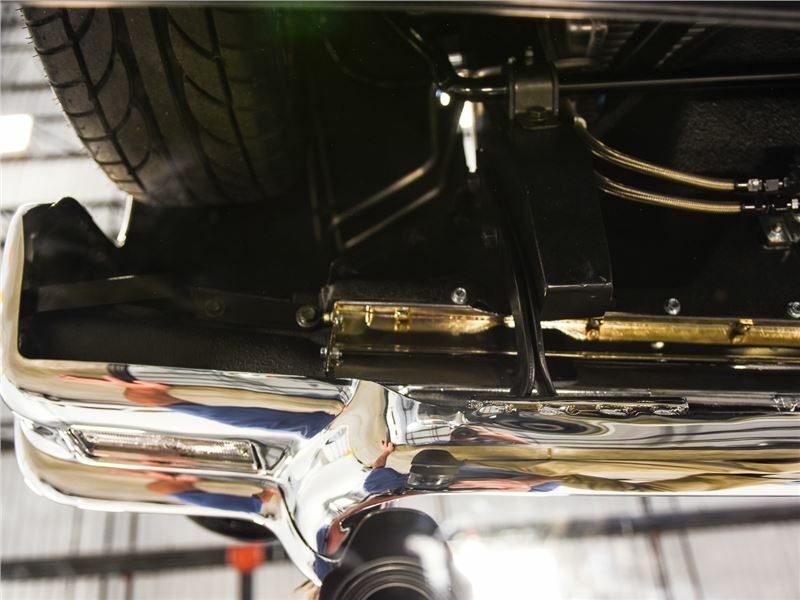 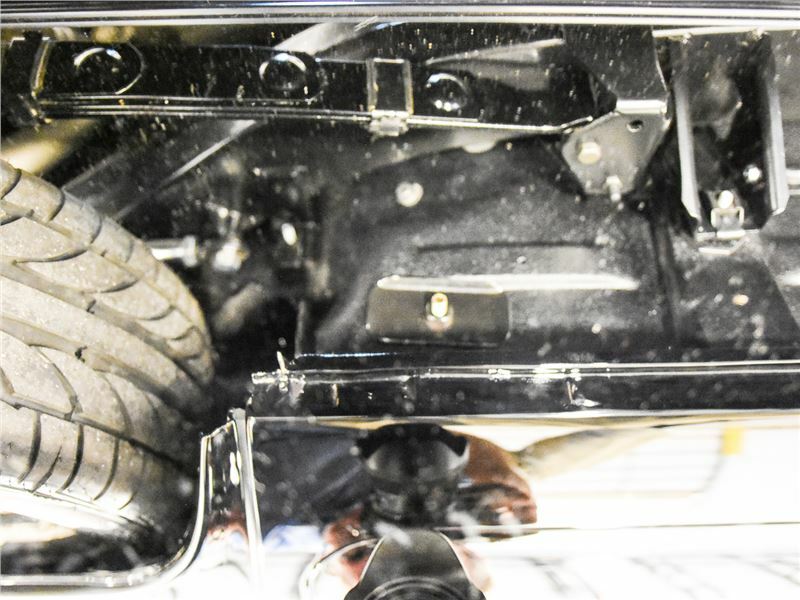 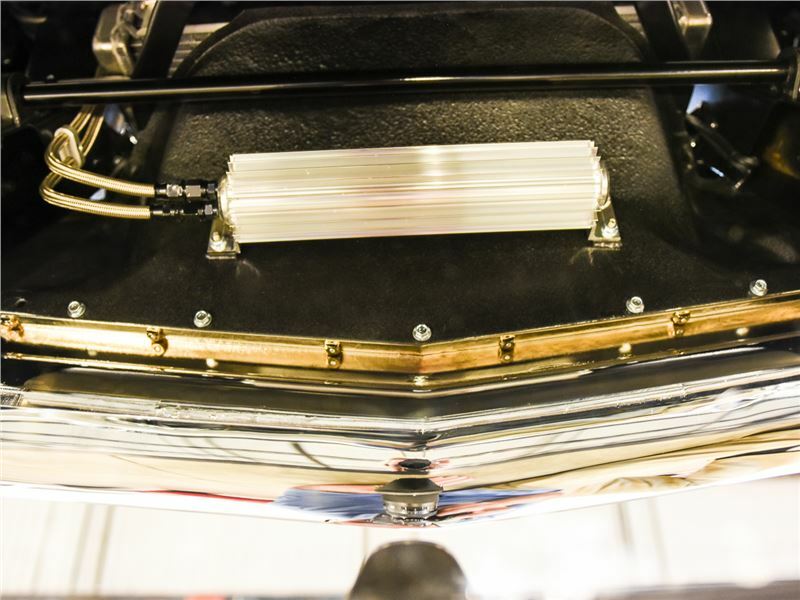 The hydroboost Wilwood Master cylinder provides serious stopping ability to the 6-piston front calipers allowing this car to stop on a dime. 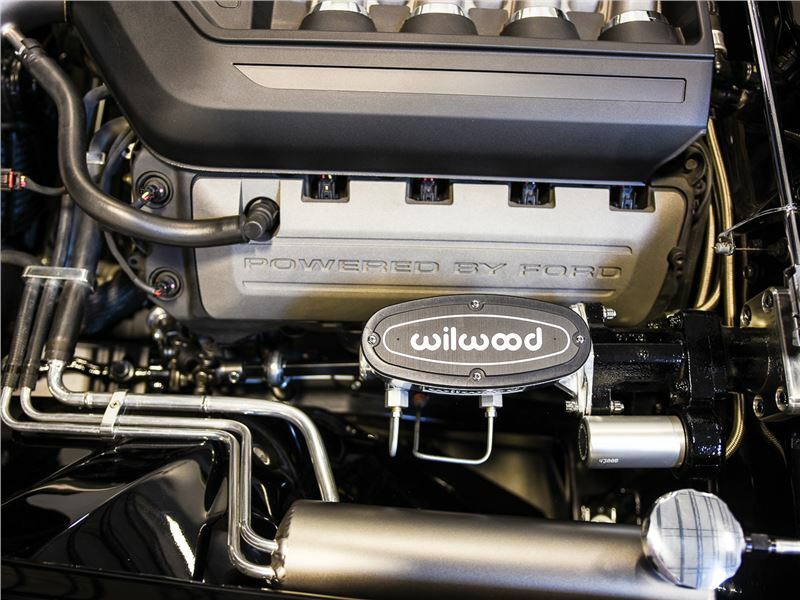 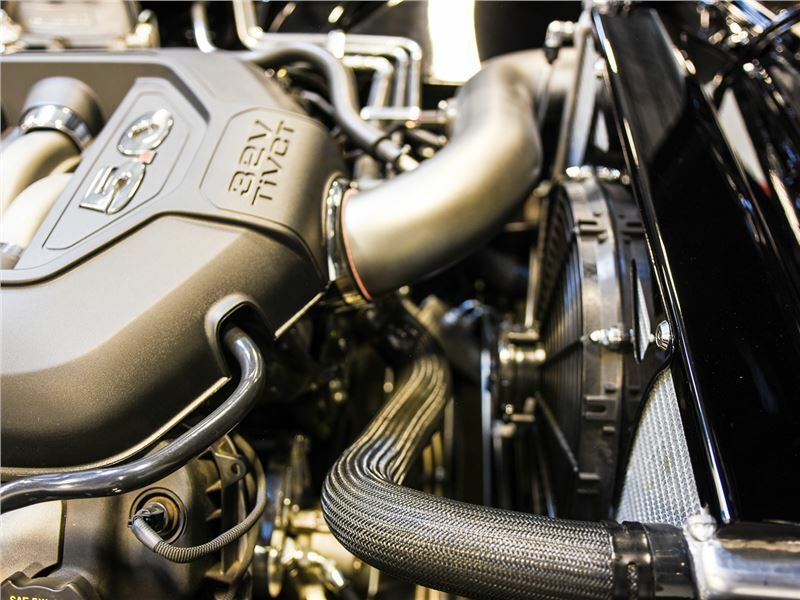 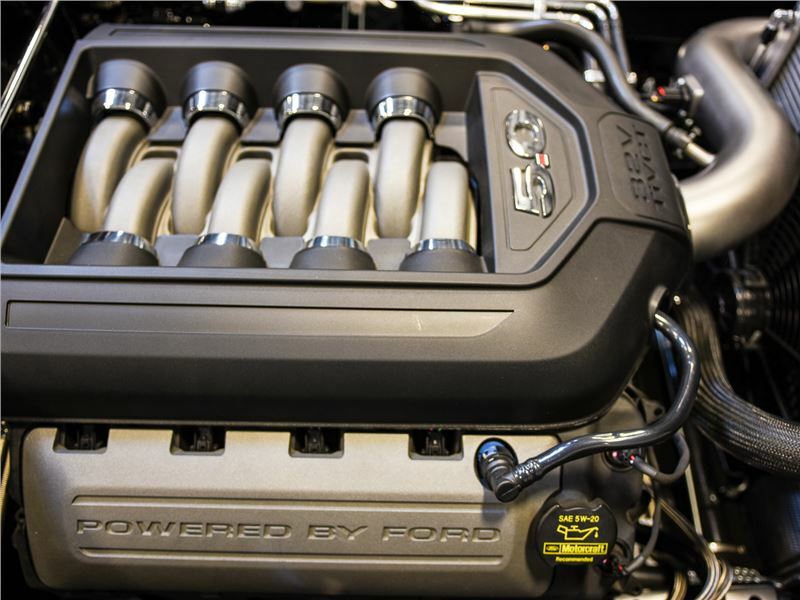 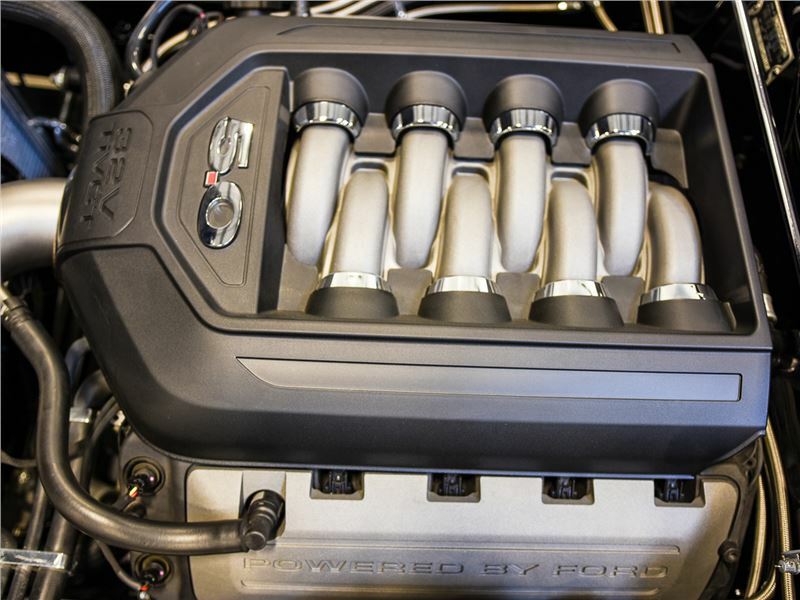 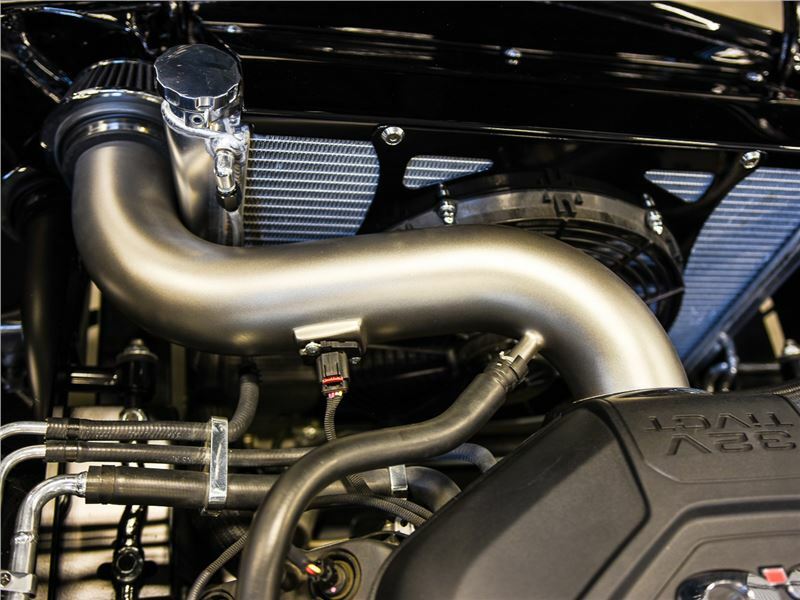 Behind the 5.0L V8 is a 6-Speed automatic transmission for easy cruising no matter what speed you are going and hooked up to the 9â€ Ford rear end with 4.11:1 gears it is extremely peppy! 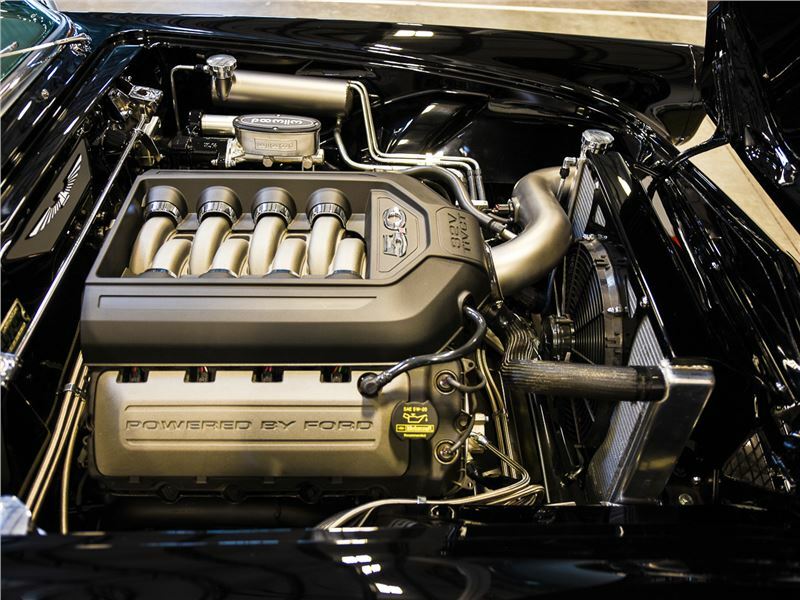 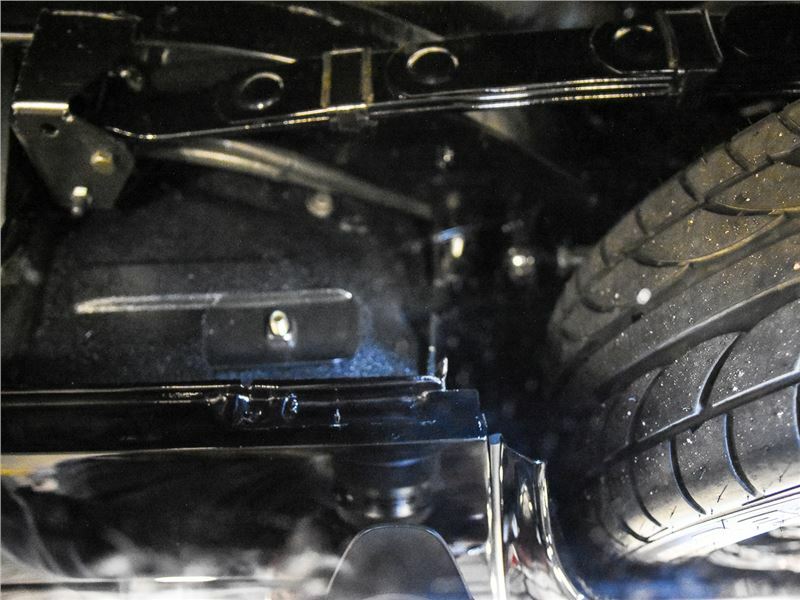 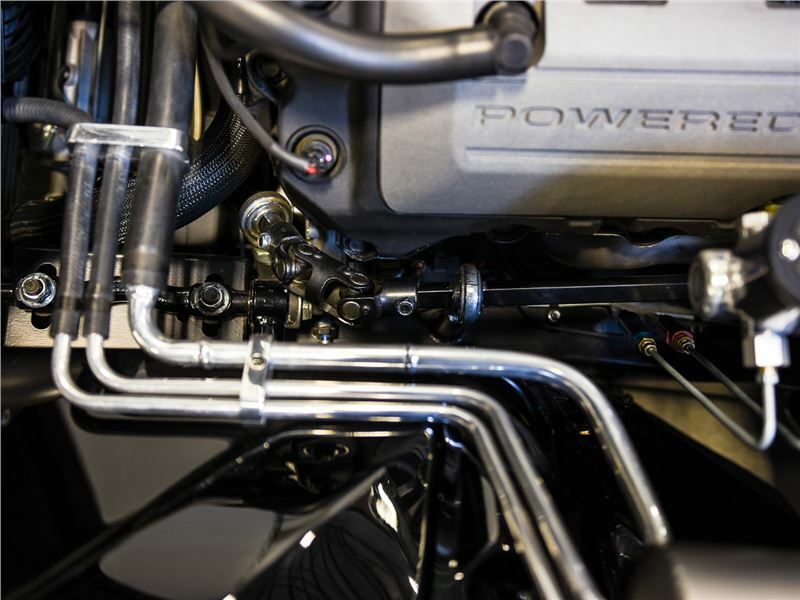 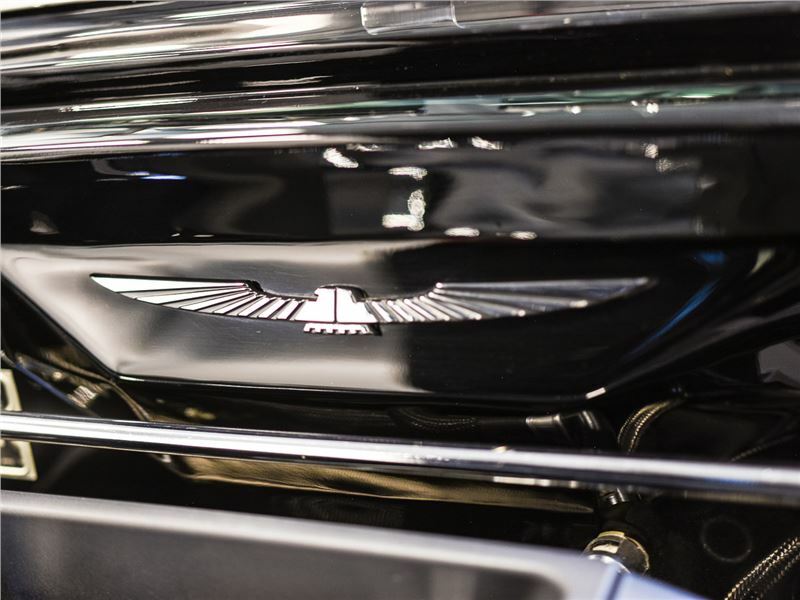 Even with this drivetrain though, it is hard to believe this car is anything but a work of art. 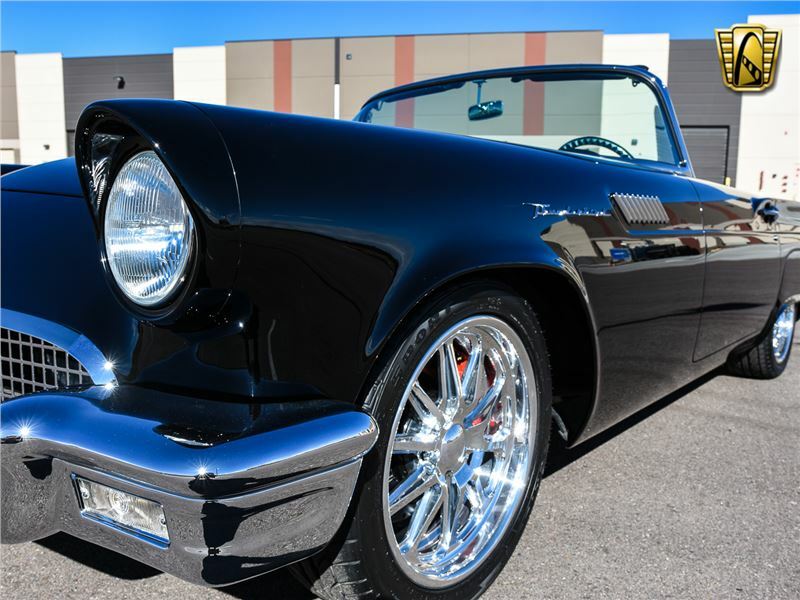 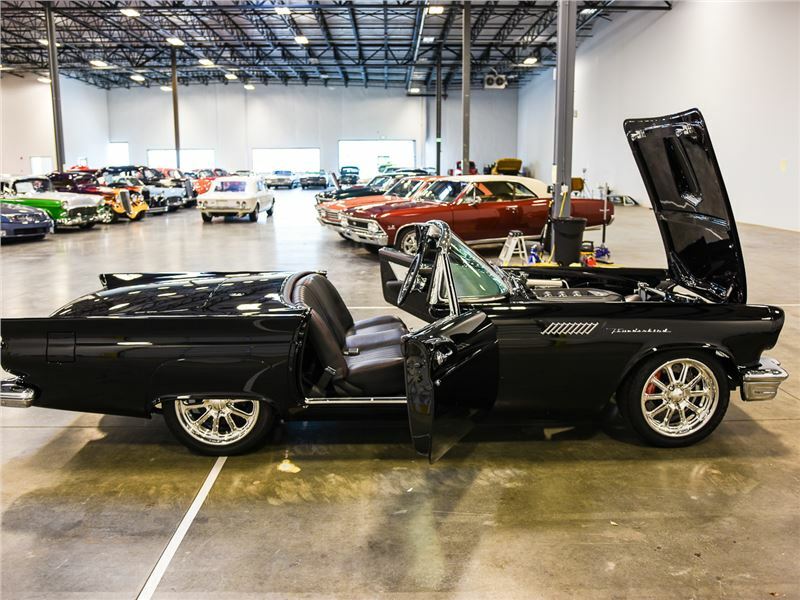 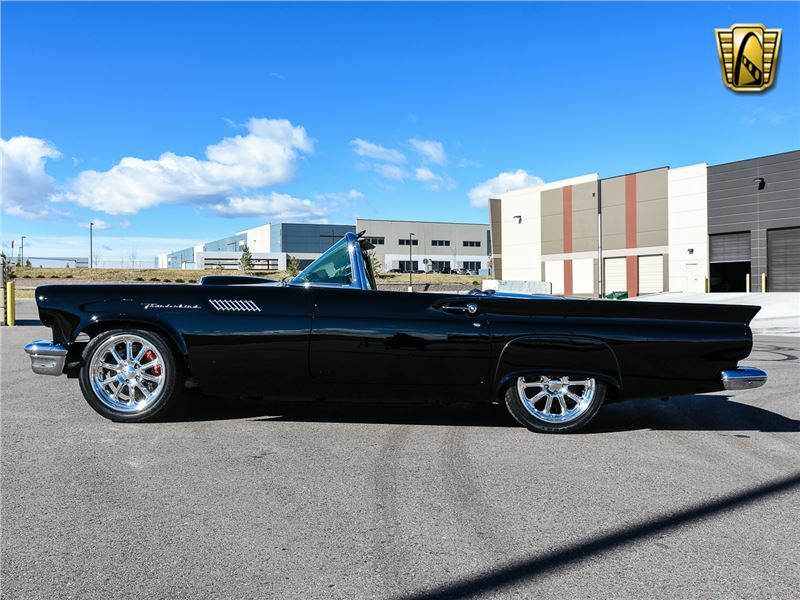 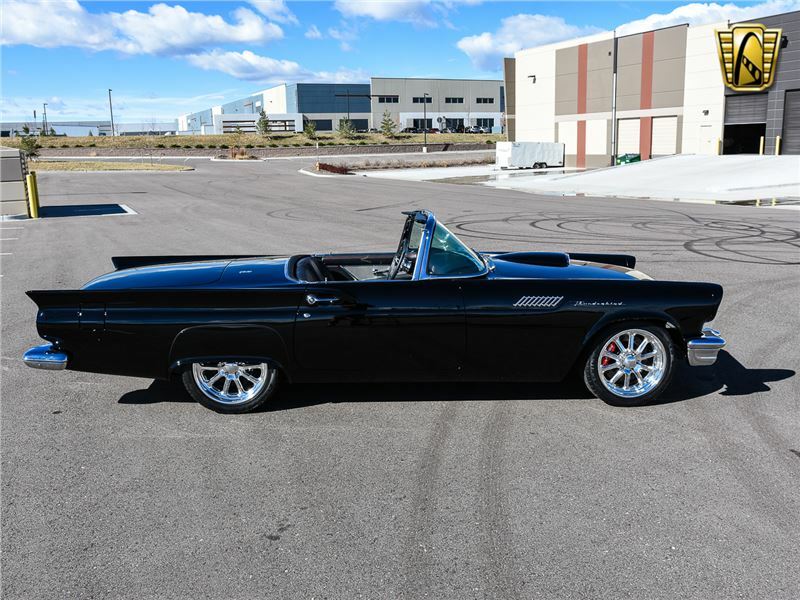 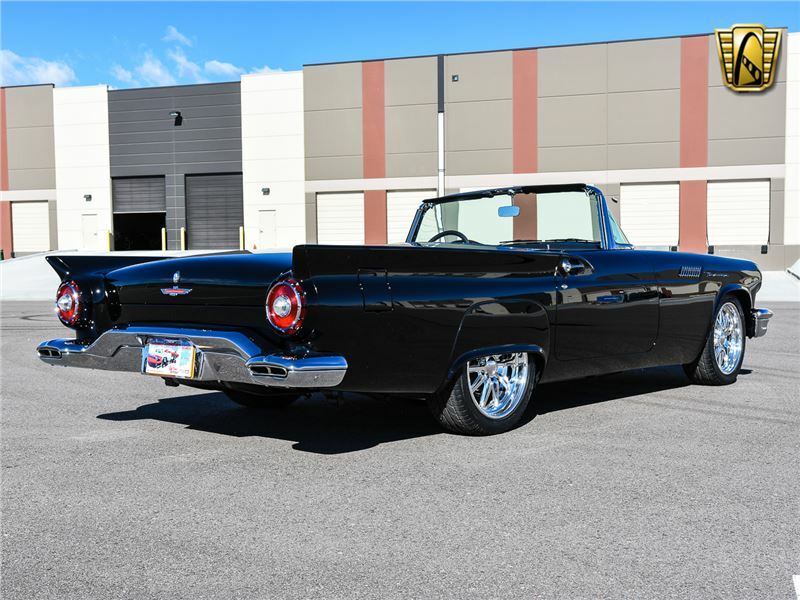 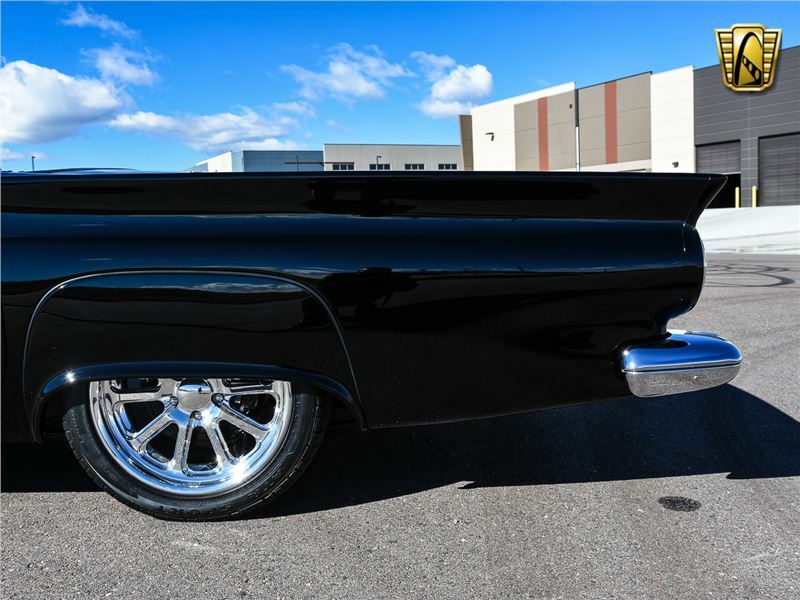 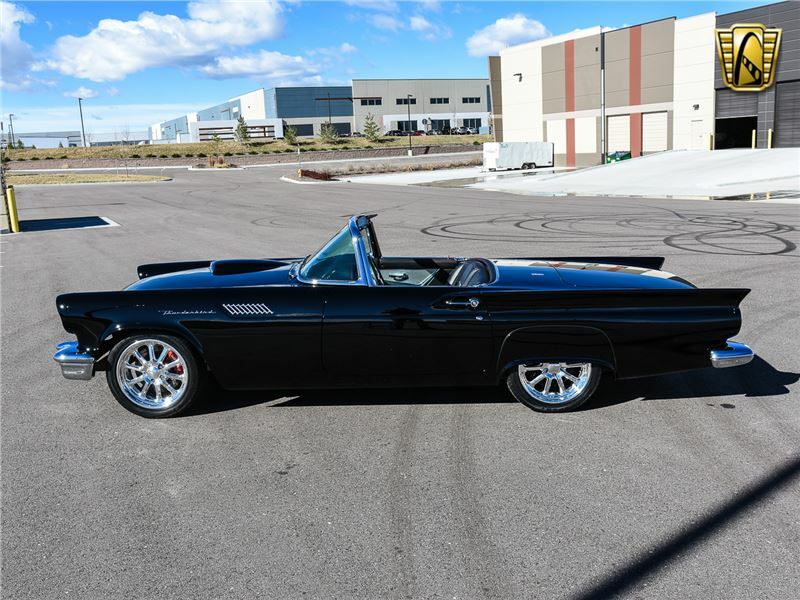 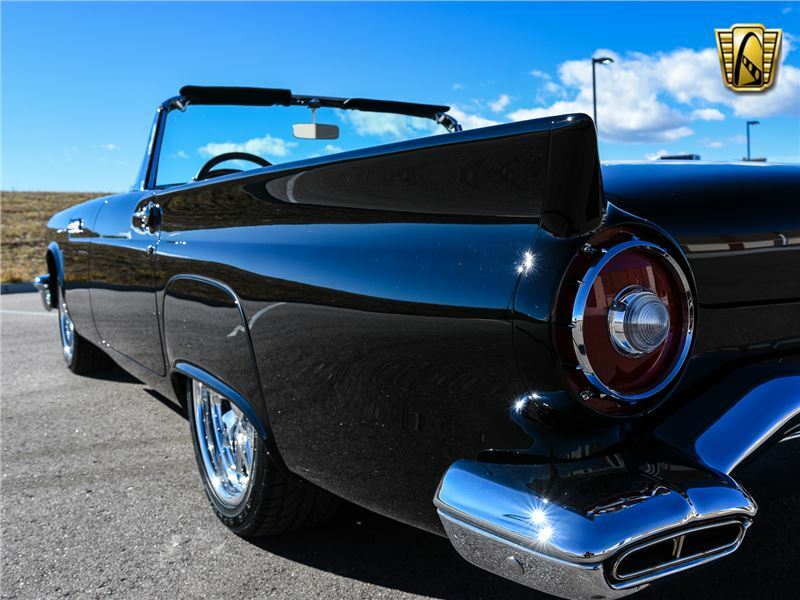 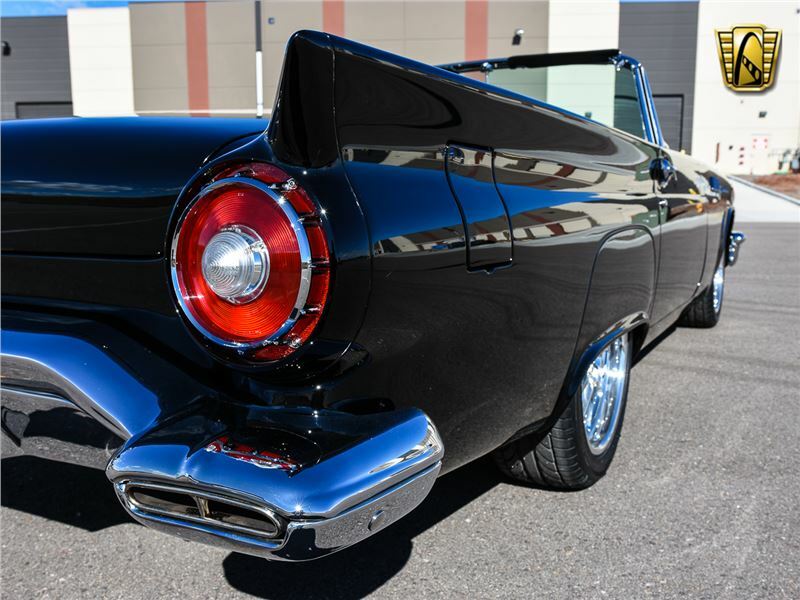 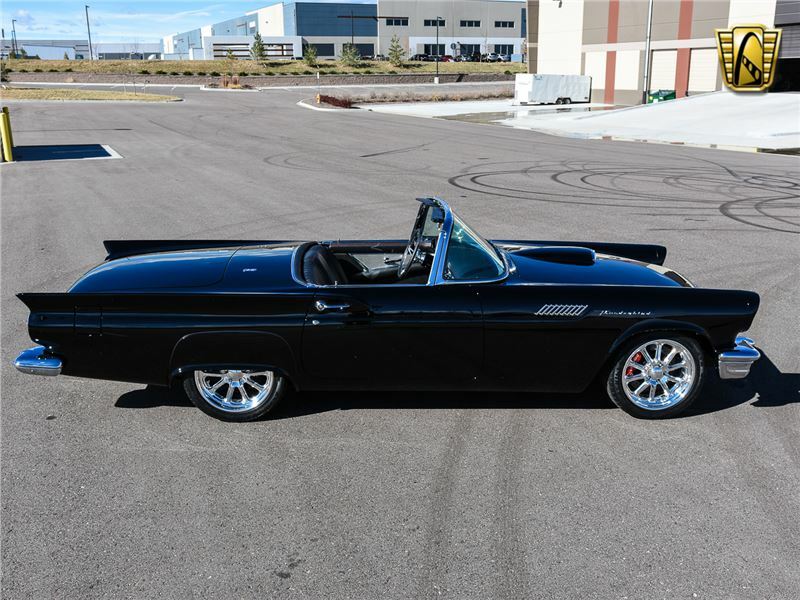 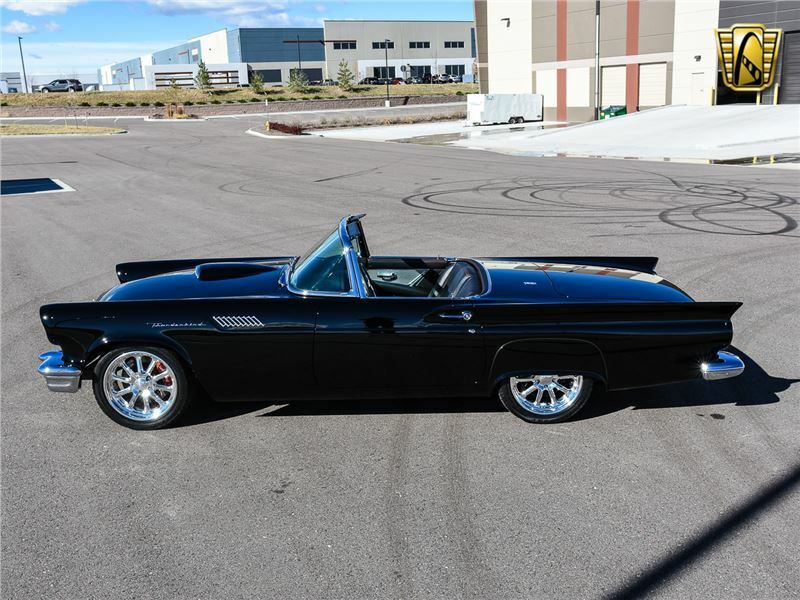 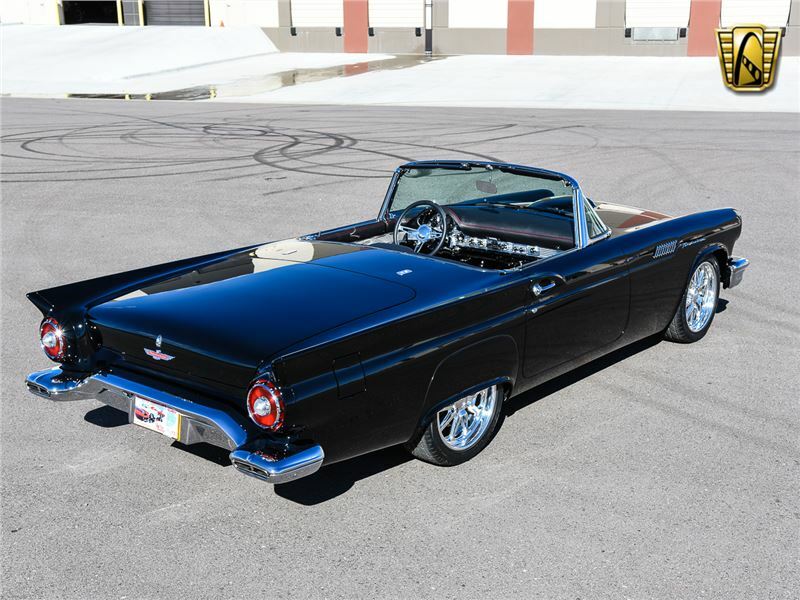 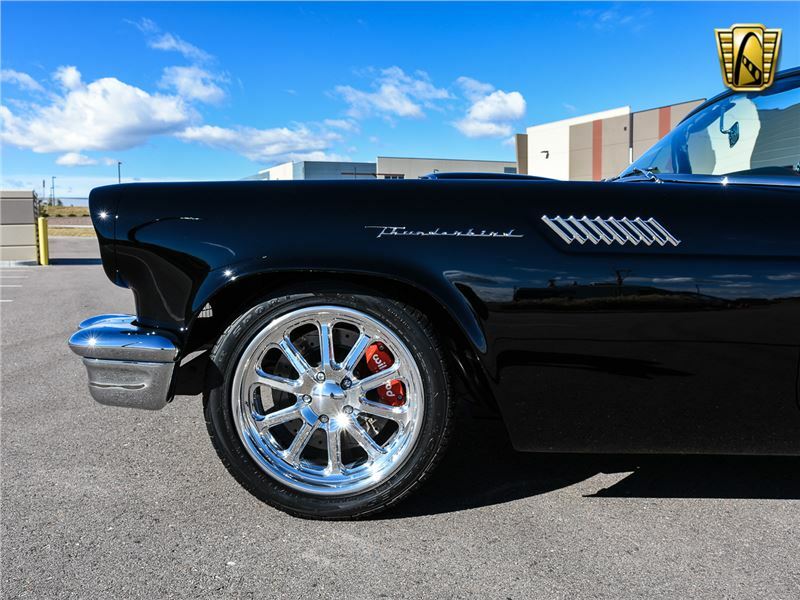 The body work is top notch and, with a well done black paint job laid atop of it, you can pick this car out from a crowd of Thunderbirds and will win best of class nearly anywhere it goes. 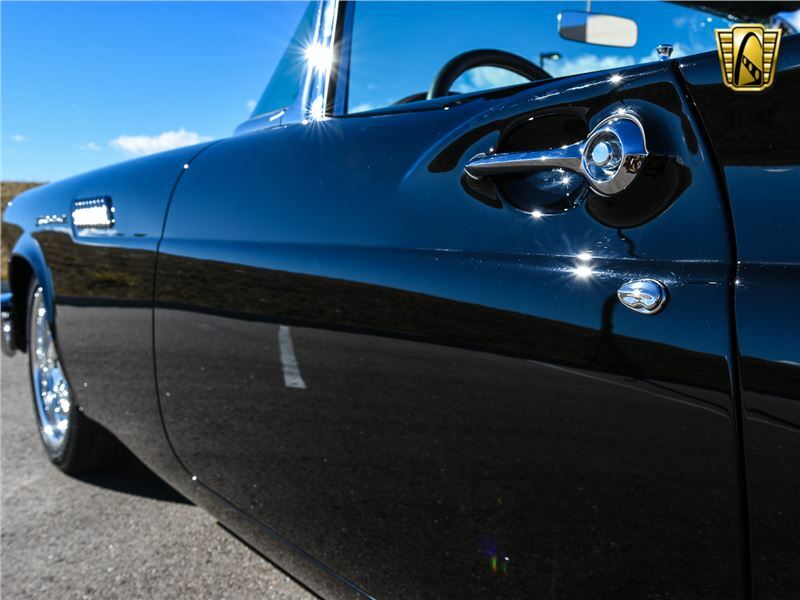 The black with polished accents is a timeless look and this car will never go out of style no matter how many years pass. 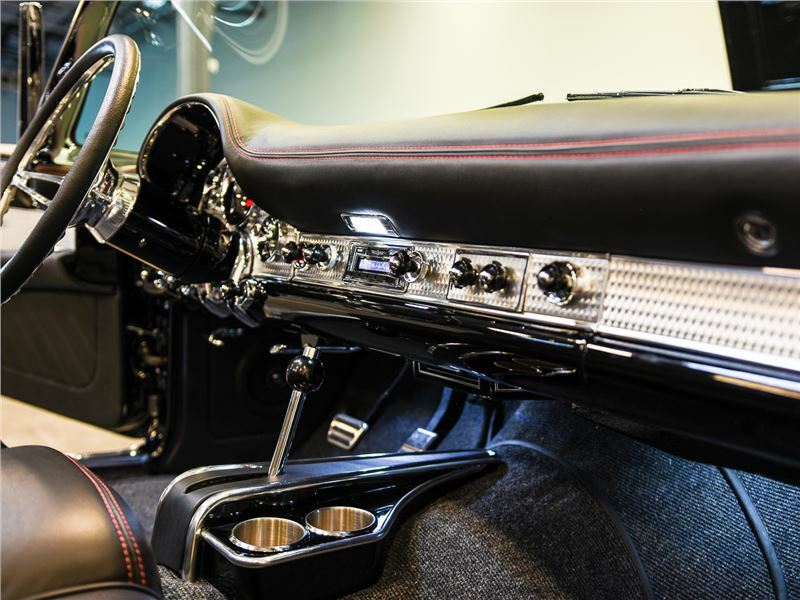 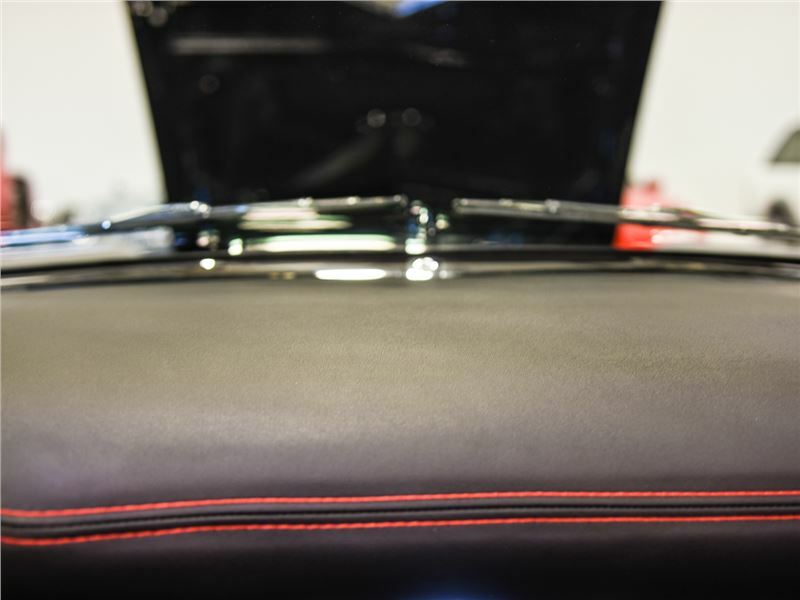 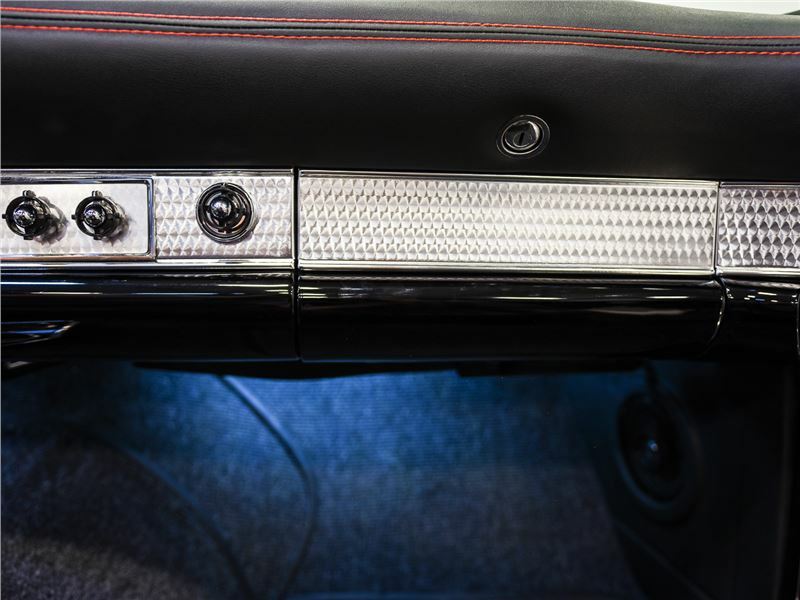 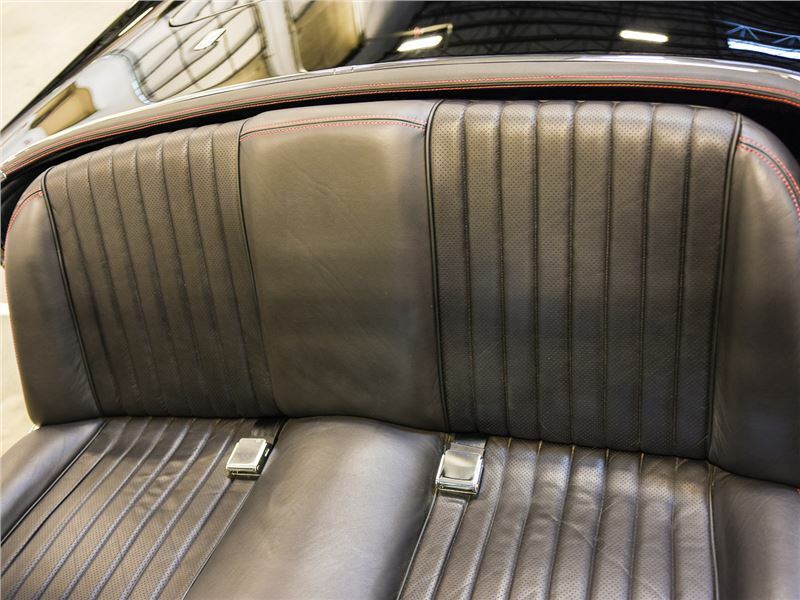 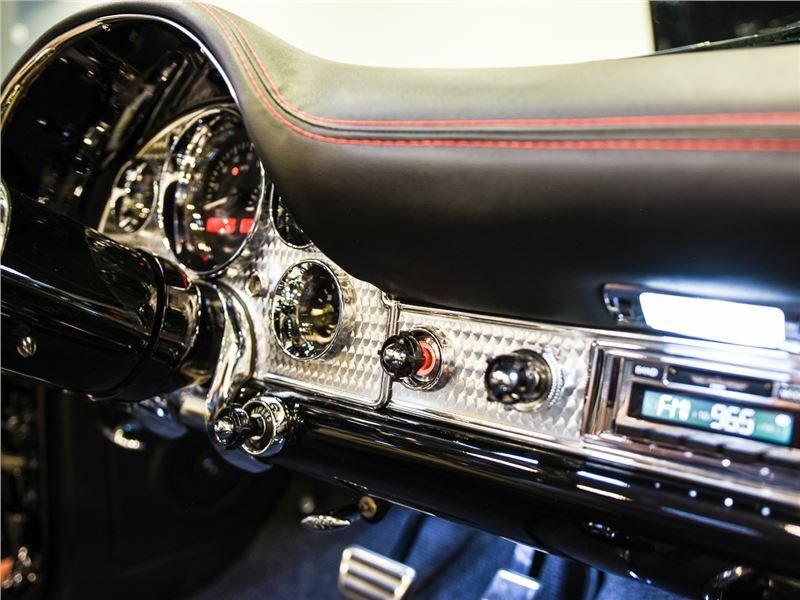 The interior keeps this theme going with a high quality grade of leather with red thread accents and polished aluminum and chrome accents. 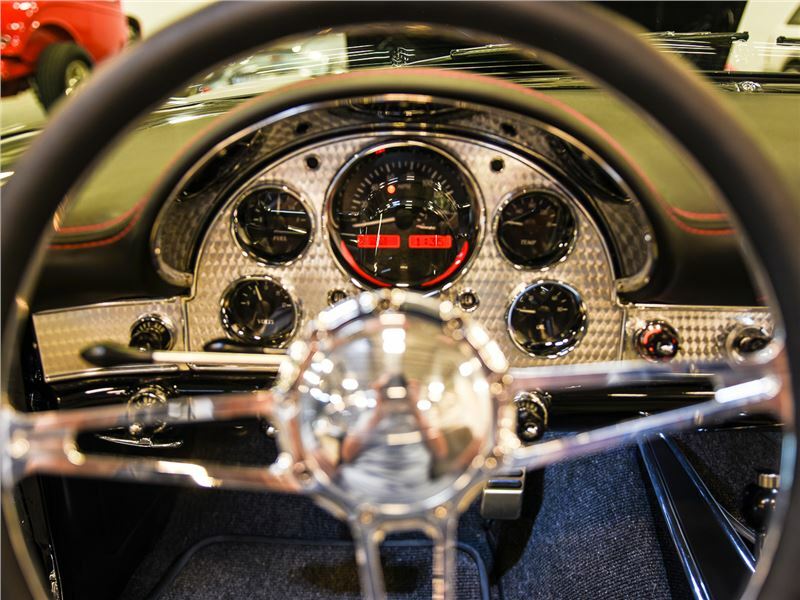 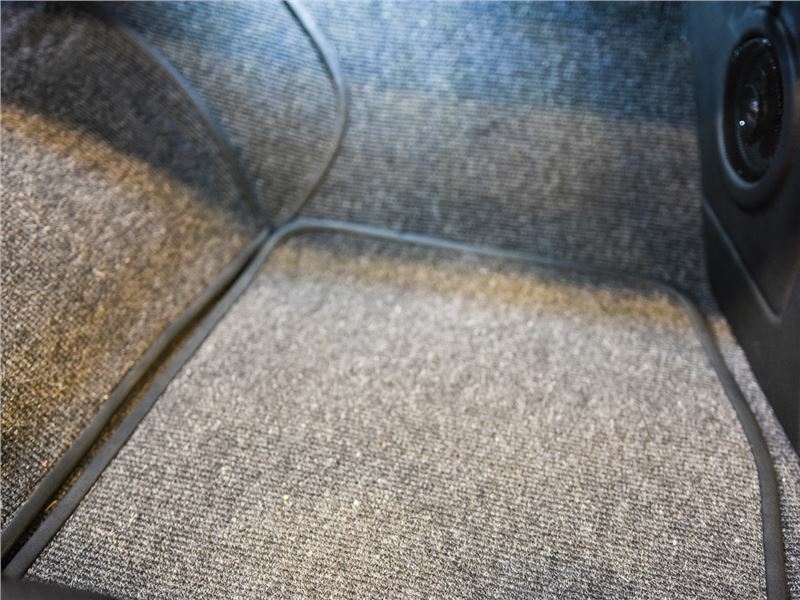 The driving position is comfortable and has plenty of room to get in and out of with the custom steering wheel. 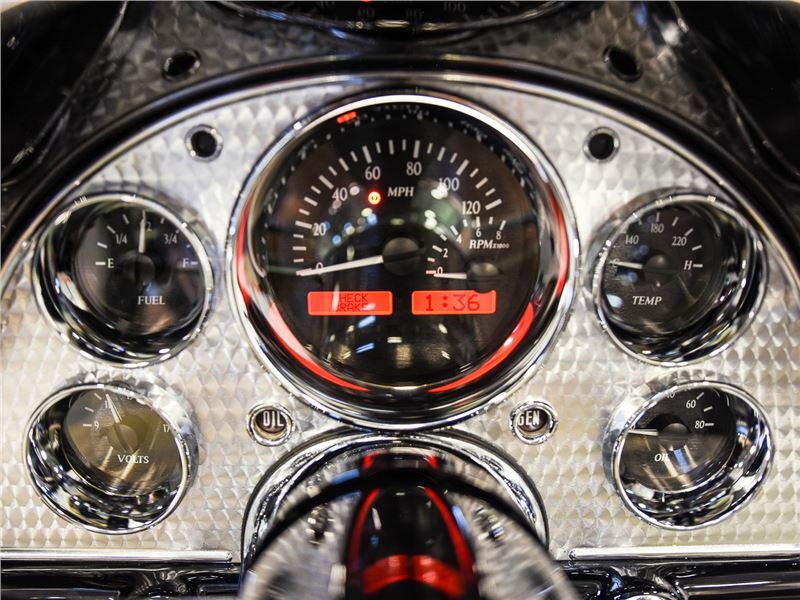 The custom gauge cluster looks appropriate for the times but are significantly more accurate and better looking than the originals. 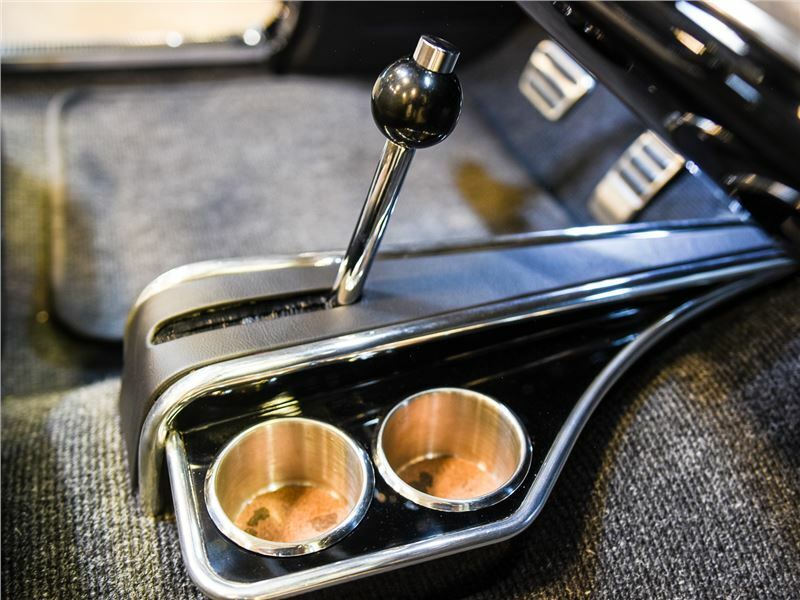 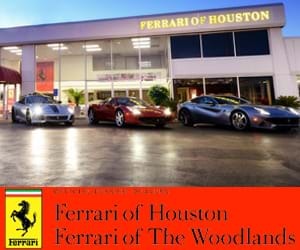 To turn on this car it is a simple turn of the hidden key and that modern V8 comes to life with no hesitation and the distinct growl of the coyote engine exudes from the rear of the car. 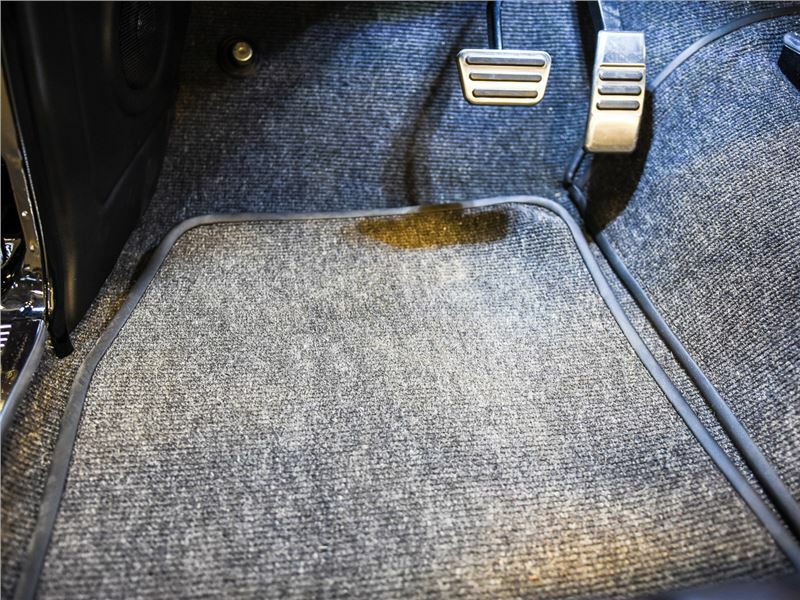 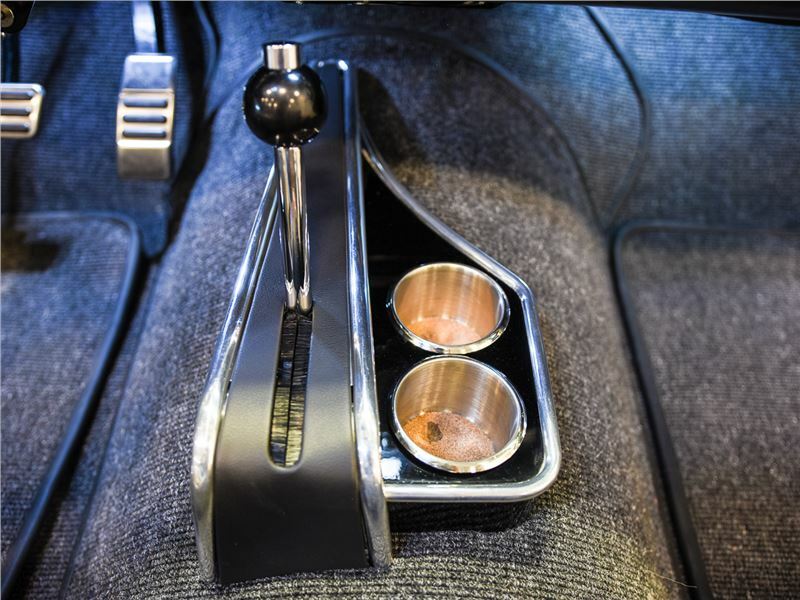 Shift it into drive and you will feel as if you set off on a cruise in a brand new car! 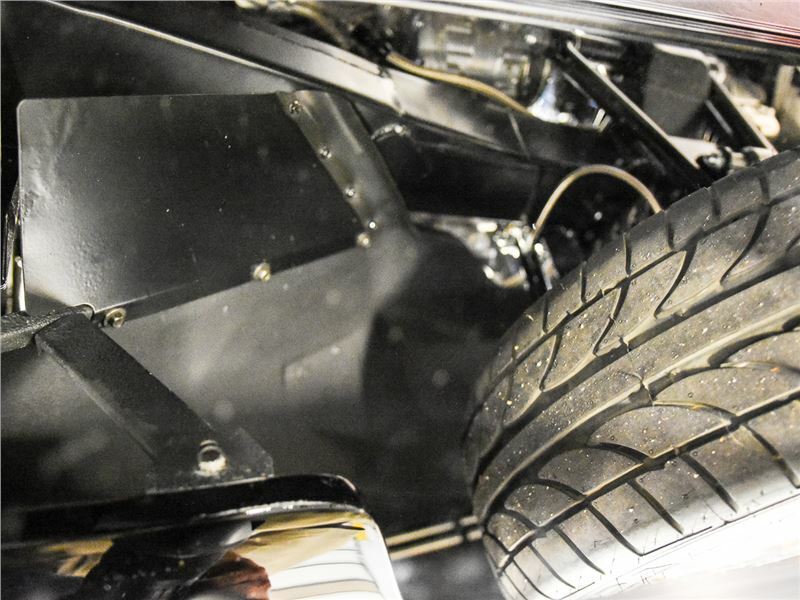 With only 160 miles since the build has been completed, everything is still very tight and feels just as good as the day it was built. 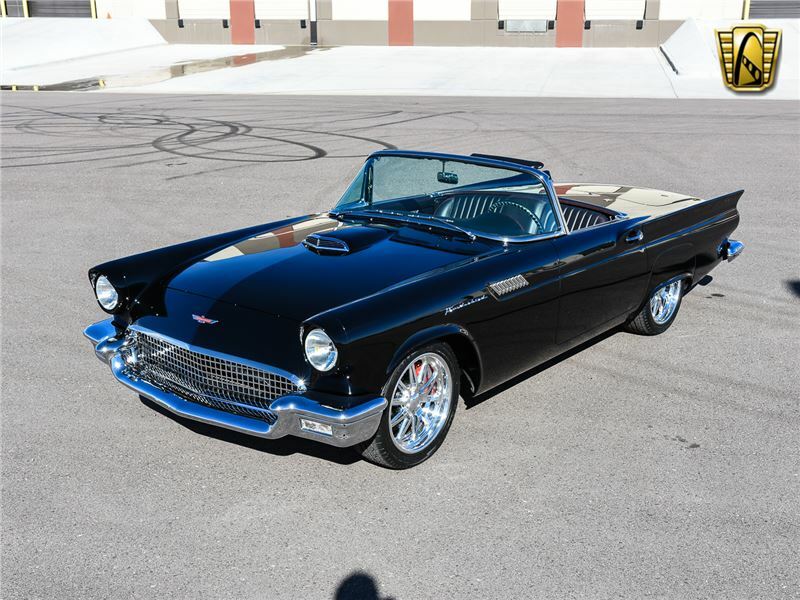 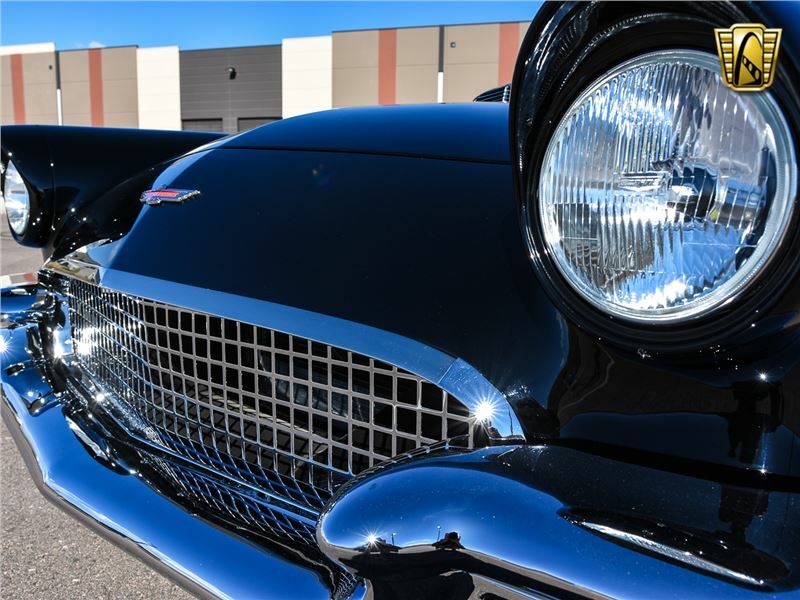 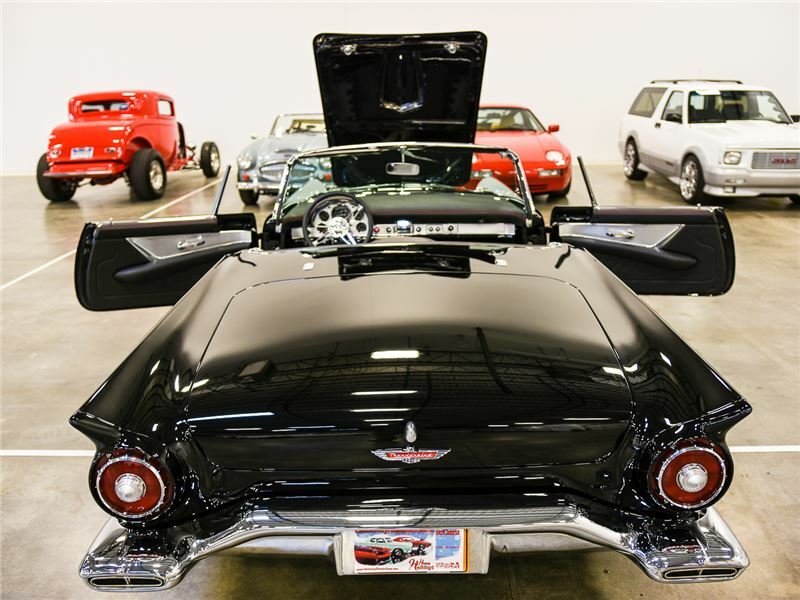 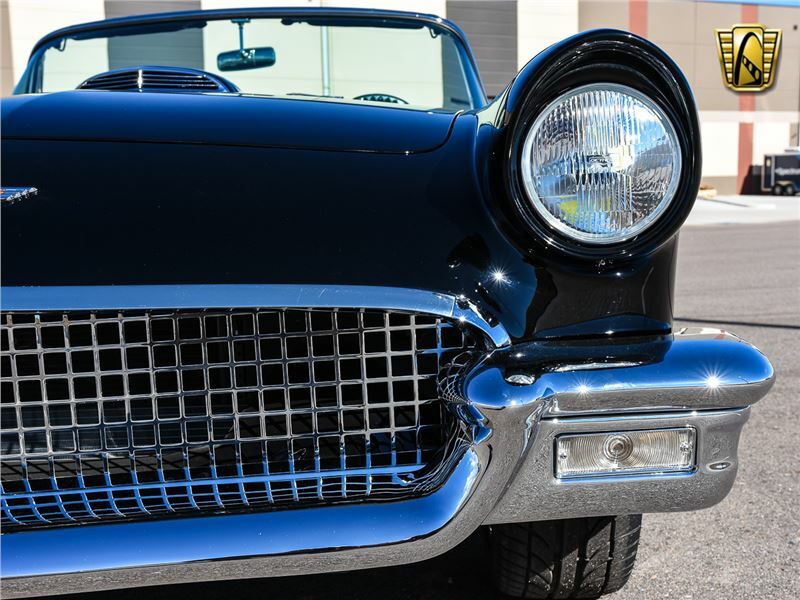 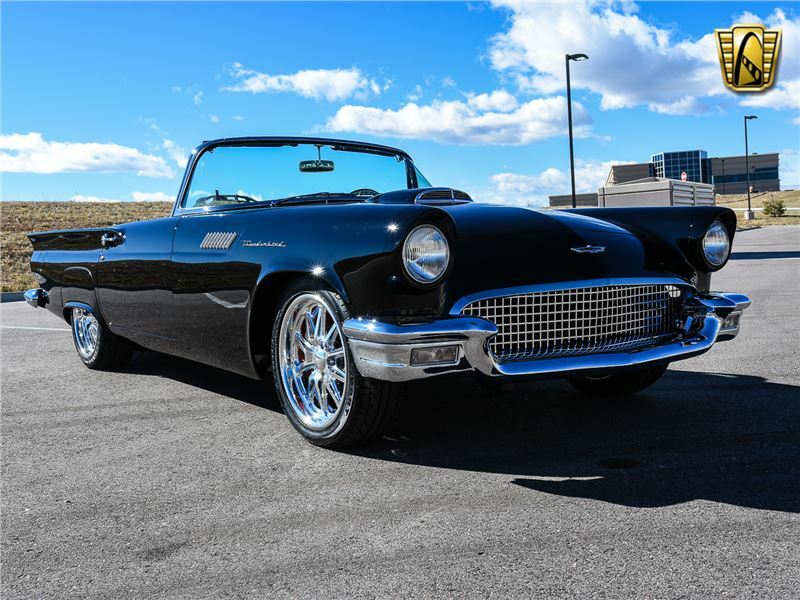 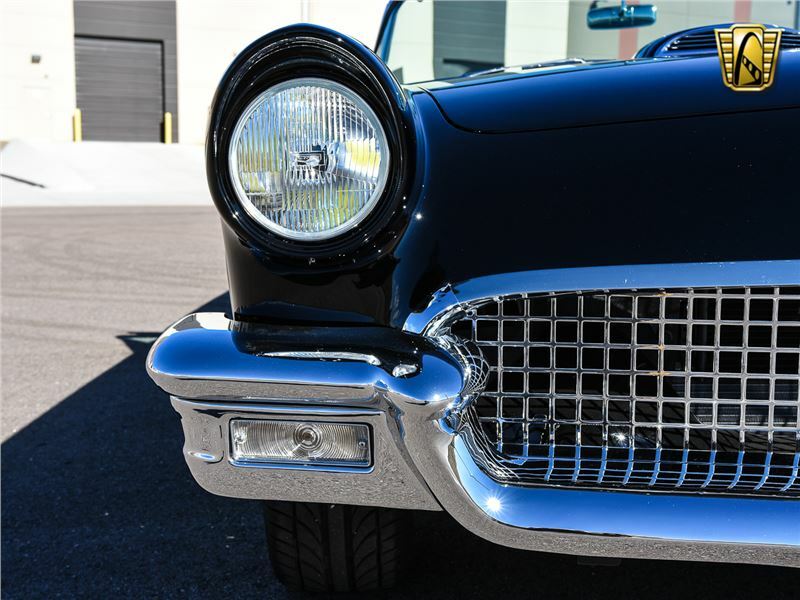 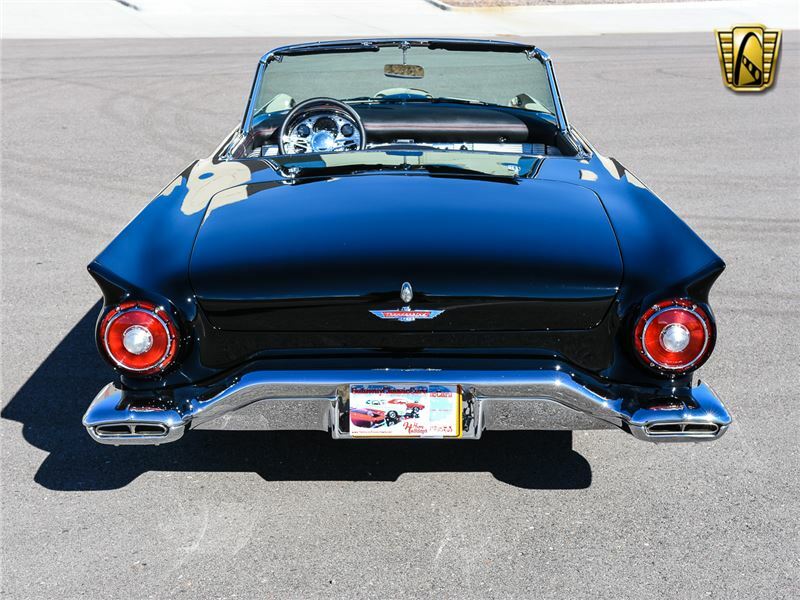 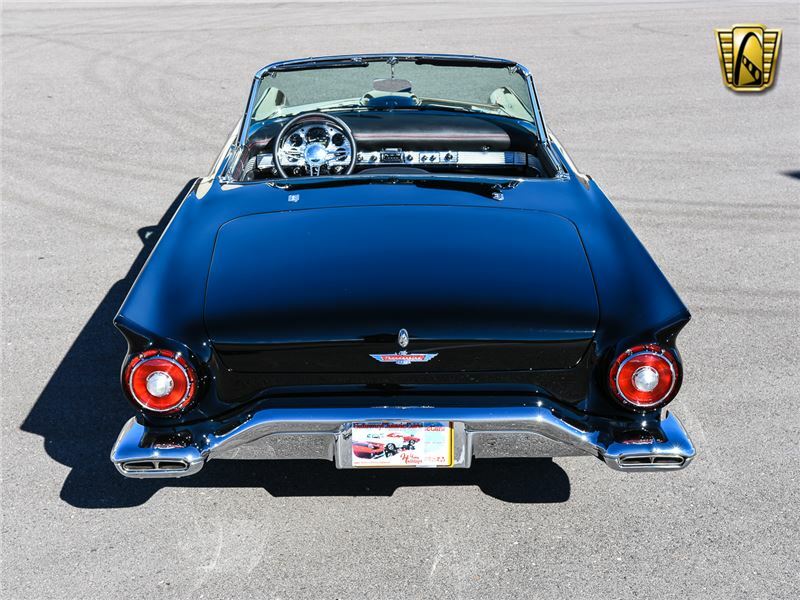 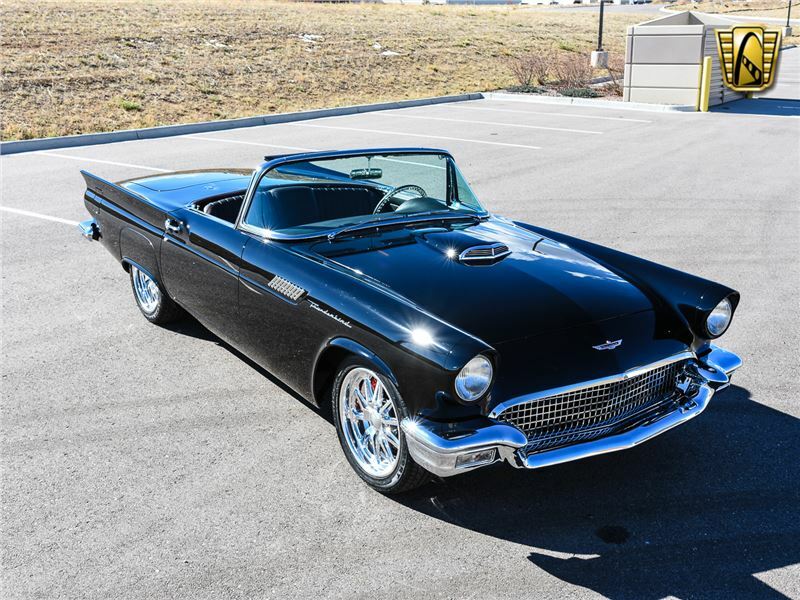 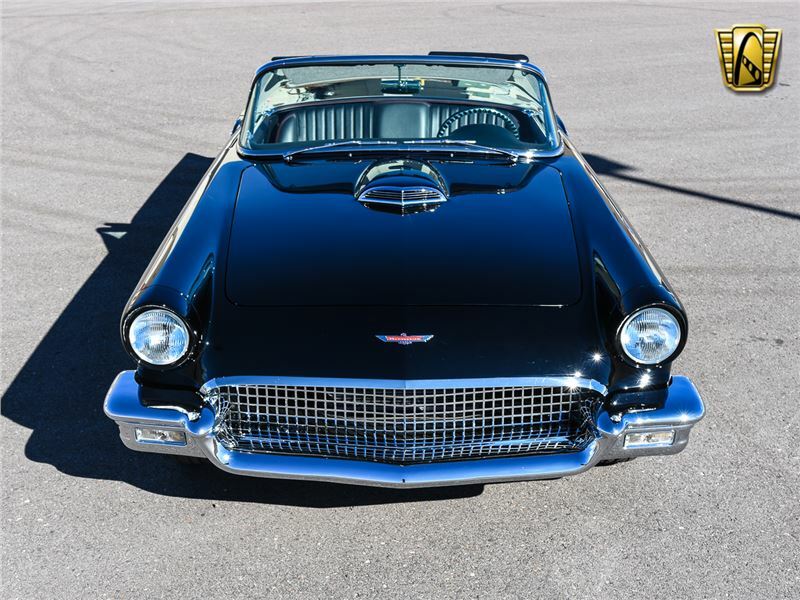 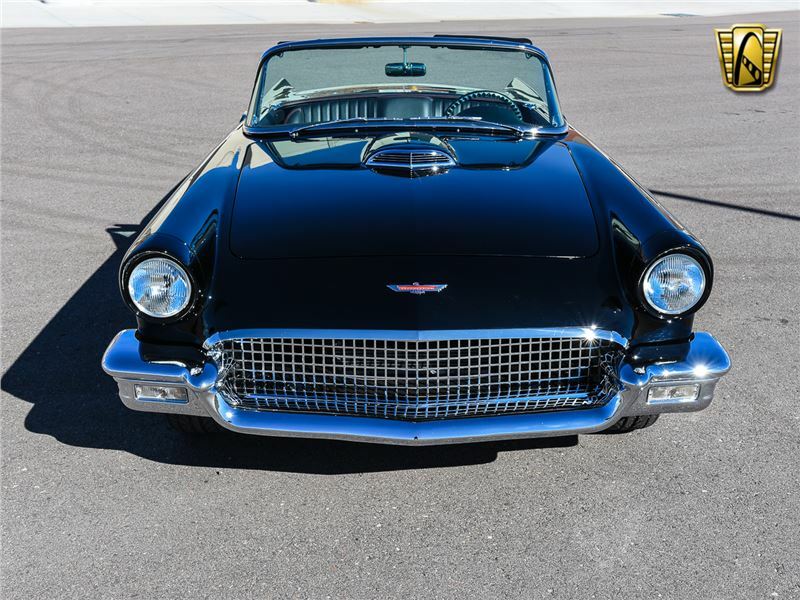 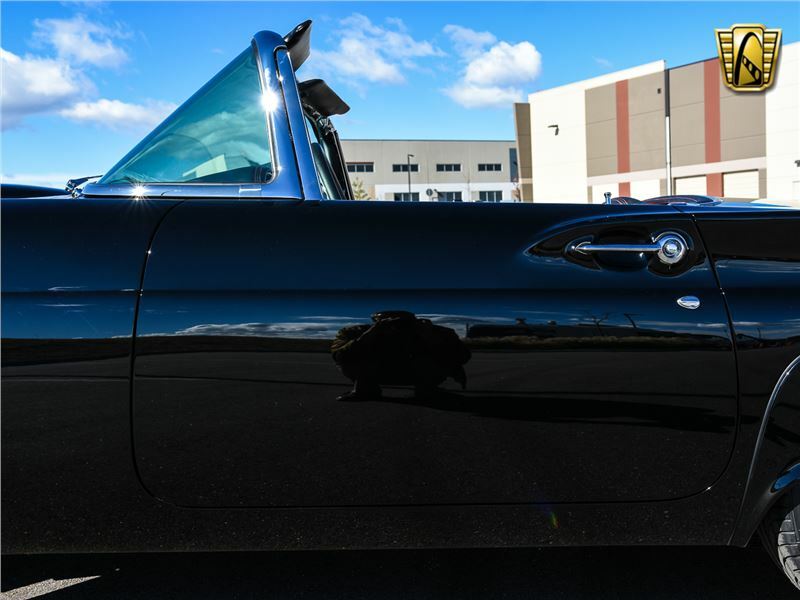 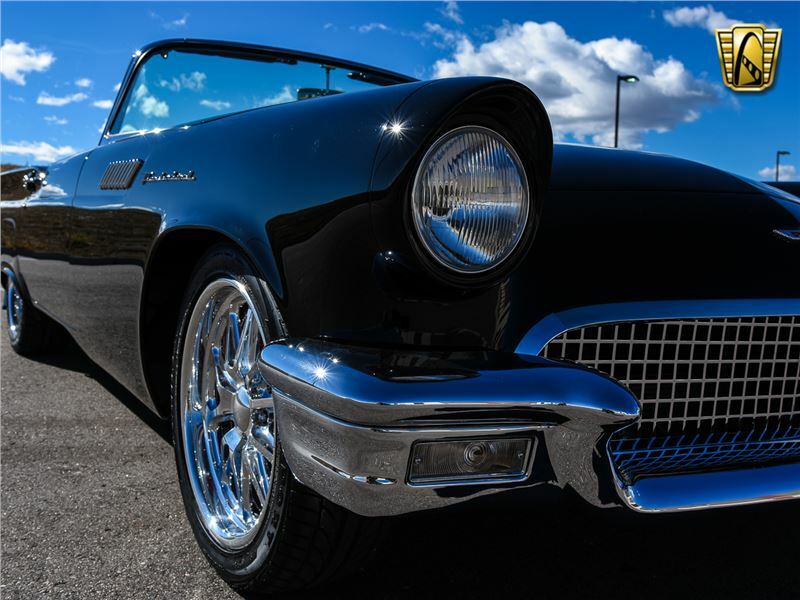 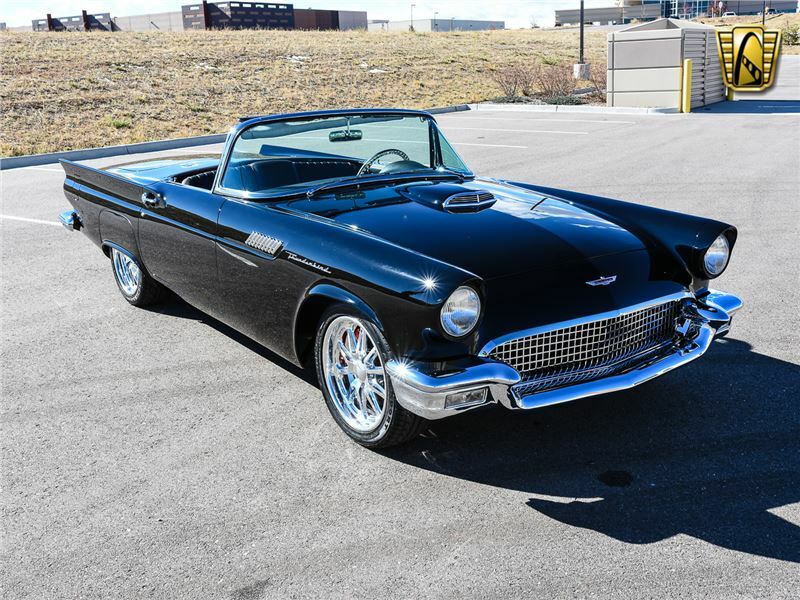 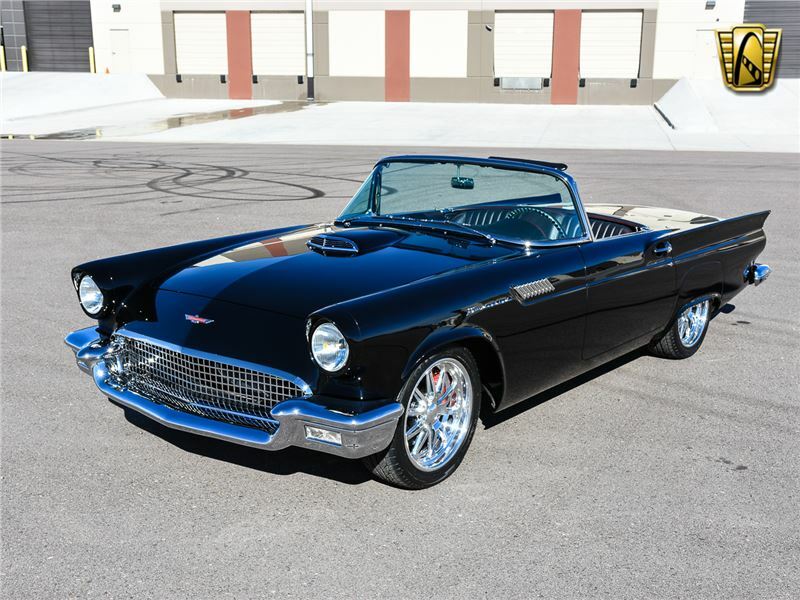 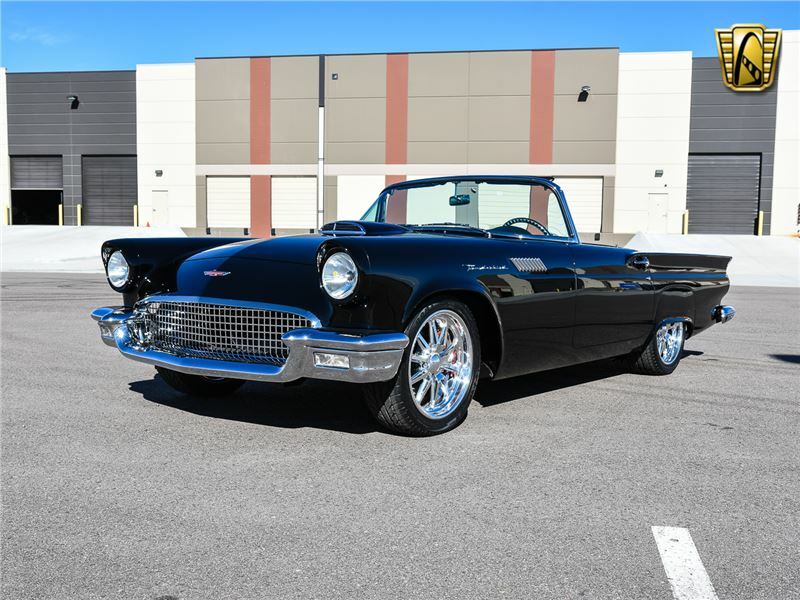 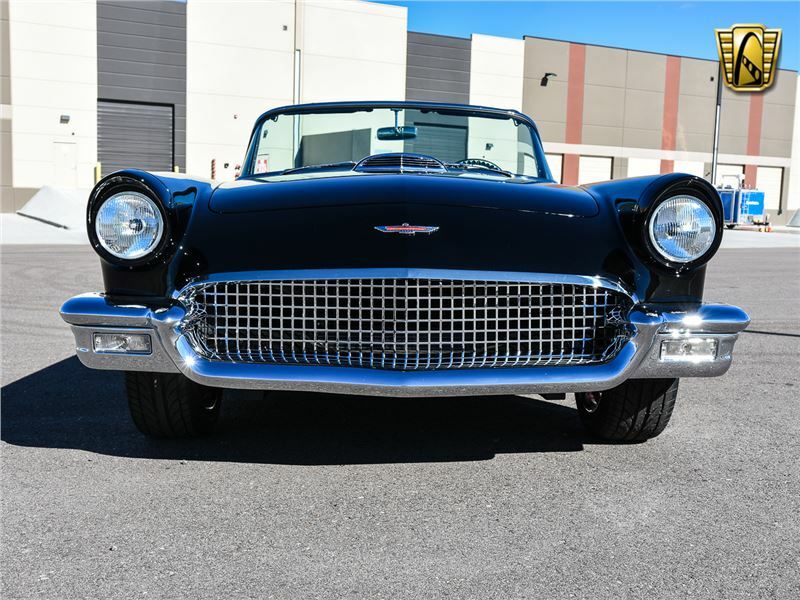 This 1957 Ford Thunderbird is the best in its class and will make the buyer a very happy owner! 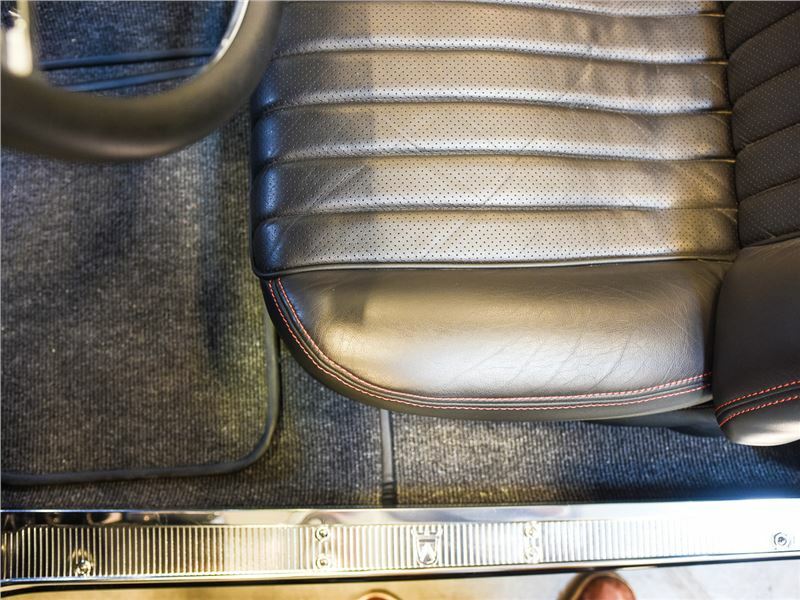 This vehicle is located in our Denver showroom. 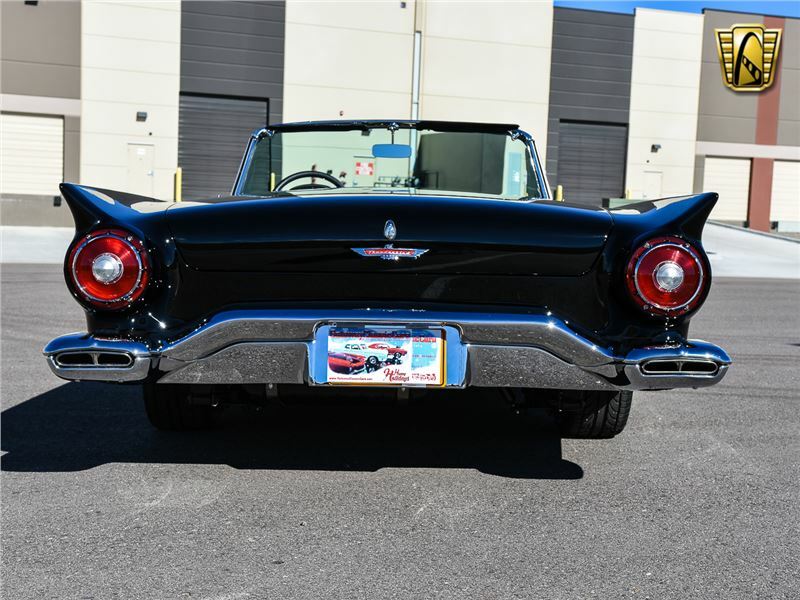 You can view this 1957 Ford Thunderbird in greater detail including HD pictures and an HD video of it running and driving at Gatewayclassiccars.com. 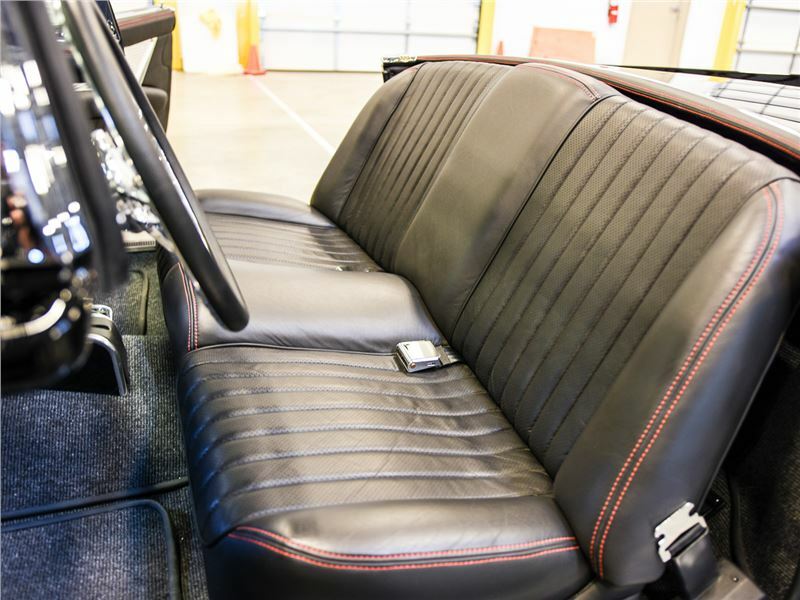 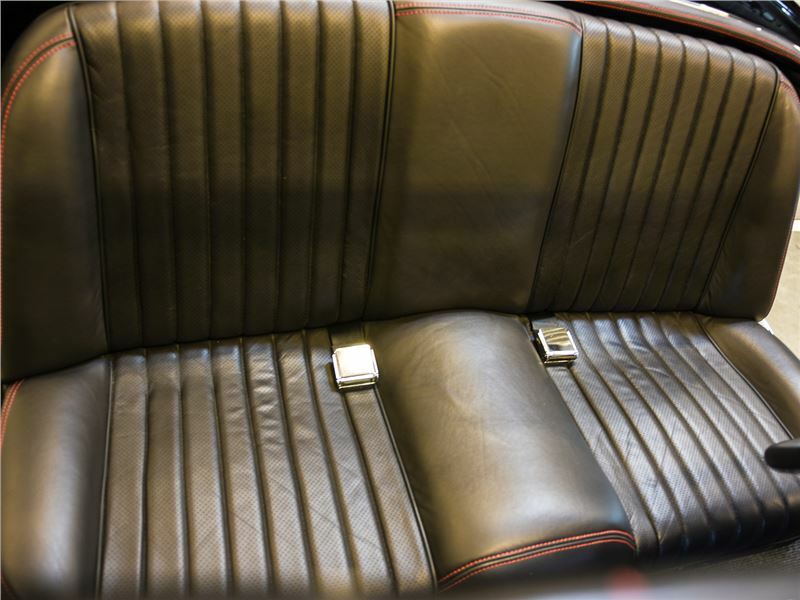 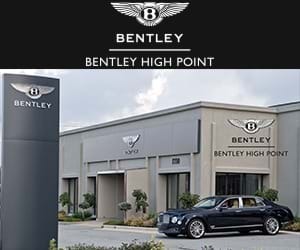 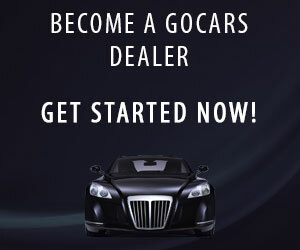 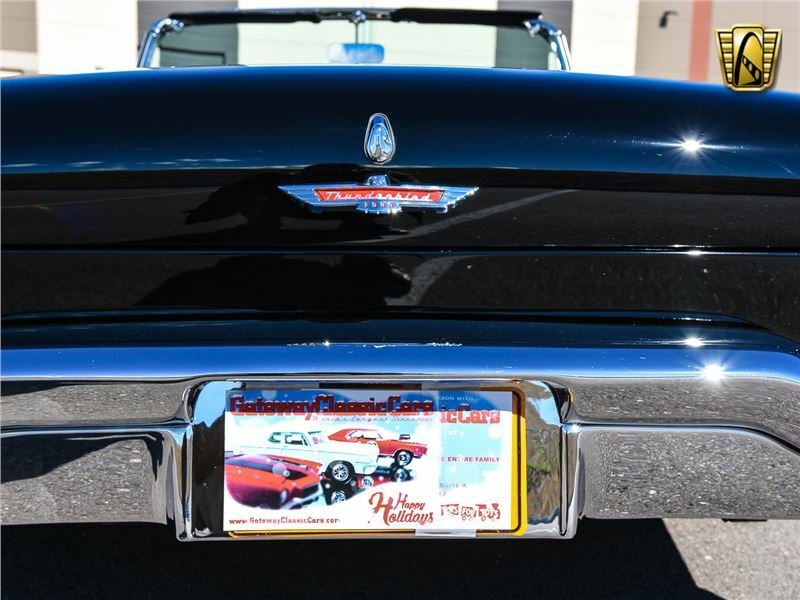 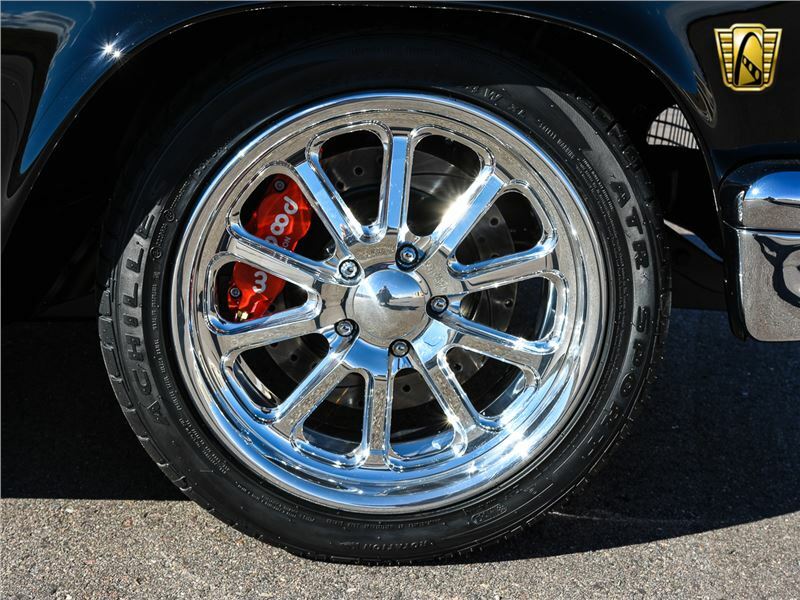 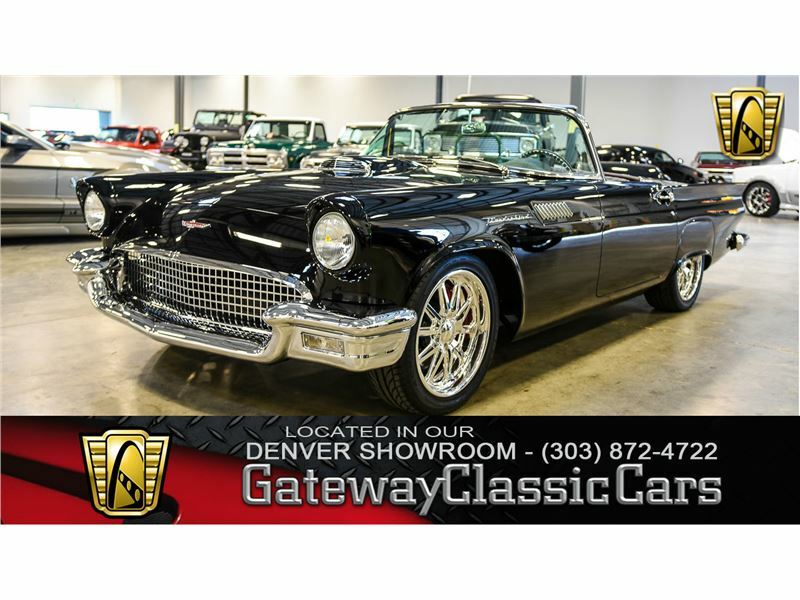 If you are interested in purchasing this vehicle or have more questions regarding it please call us at (303) 872-4722 or email us at Denver@gatewayclassiccars.com.